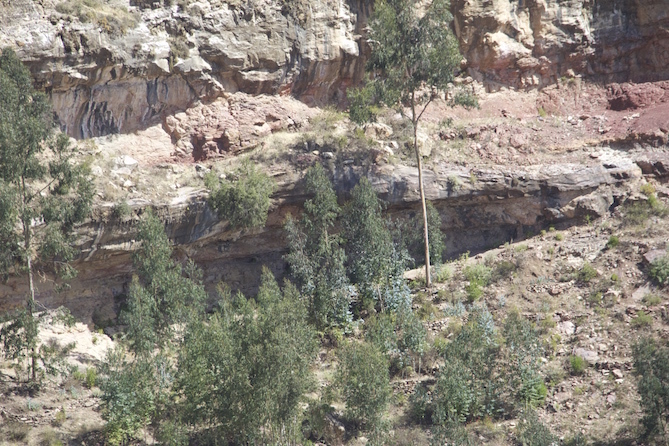 To go from Adigrat to Lalibela, we avoided the main road south of Mekelle as this road is supposed to be where a lot of kids throw stones at tourist cars. 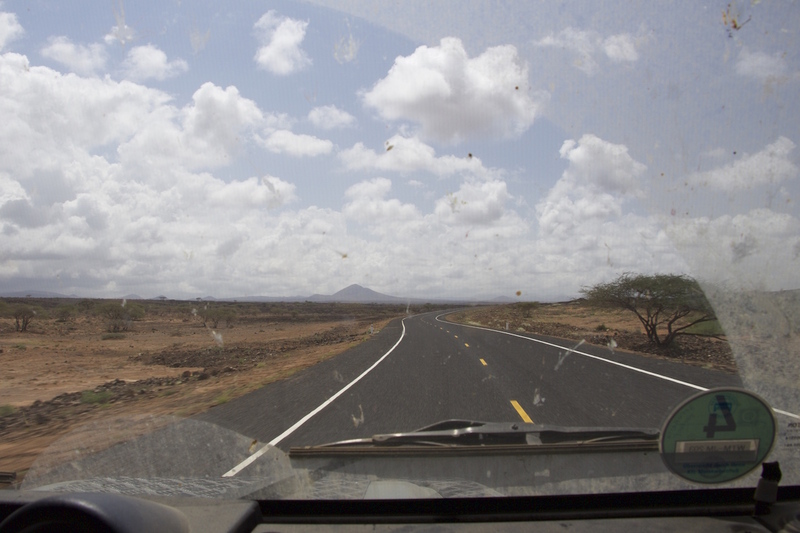 We took a parallel running road further inland instead which turned out to be a really beautiful "dirt road". 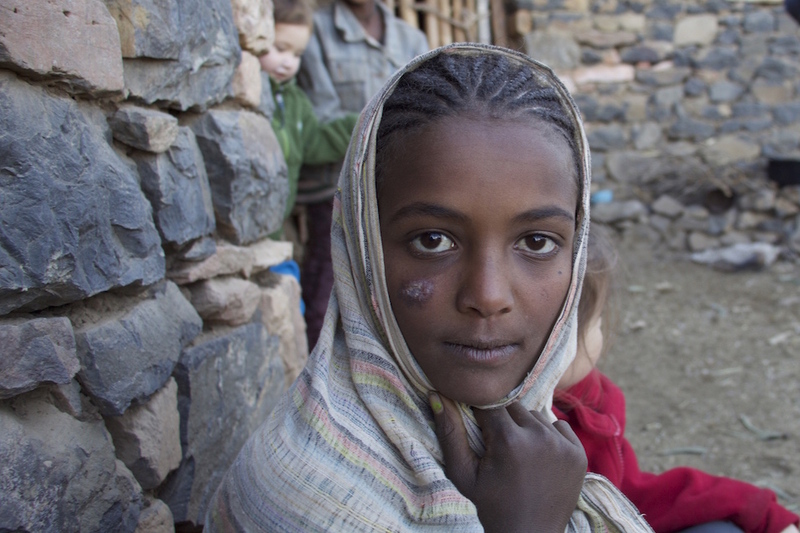 Still, our friends Stan and Anne from "Slow Donkey" had a melon-sized rock thrown at them by two youngsters which missed them only by half a meter while they were ascending into Lalibela. 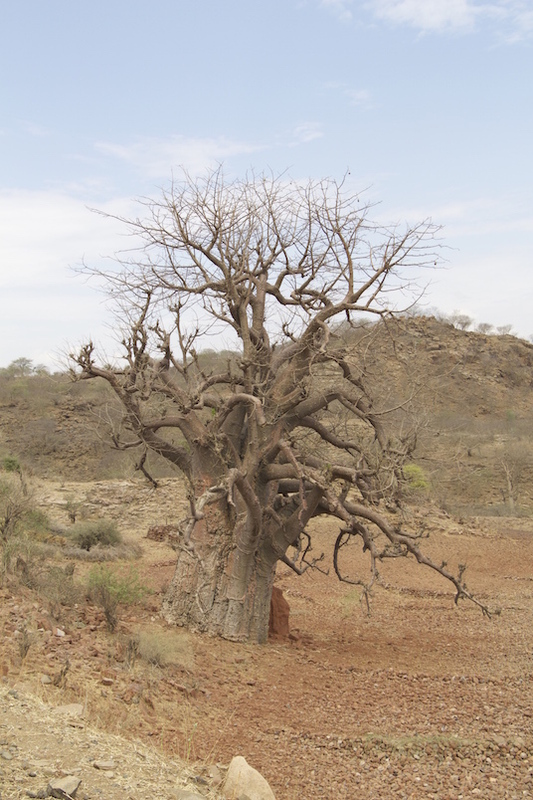 Our first Baobab tree ... they are really impressive! 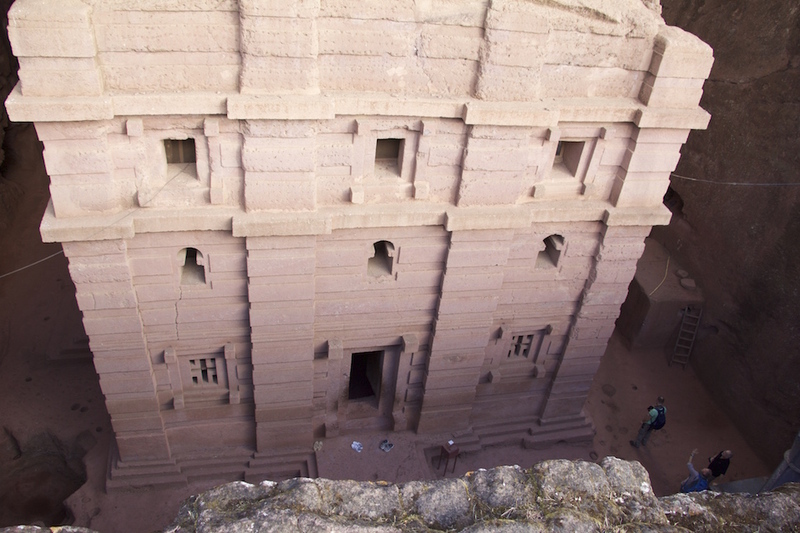 Visiting the Ethiopian rock hewn churches in Lalibela or at other places is an experience totally different to visiting other churches. 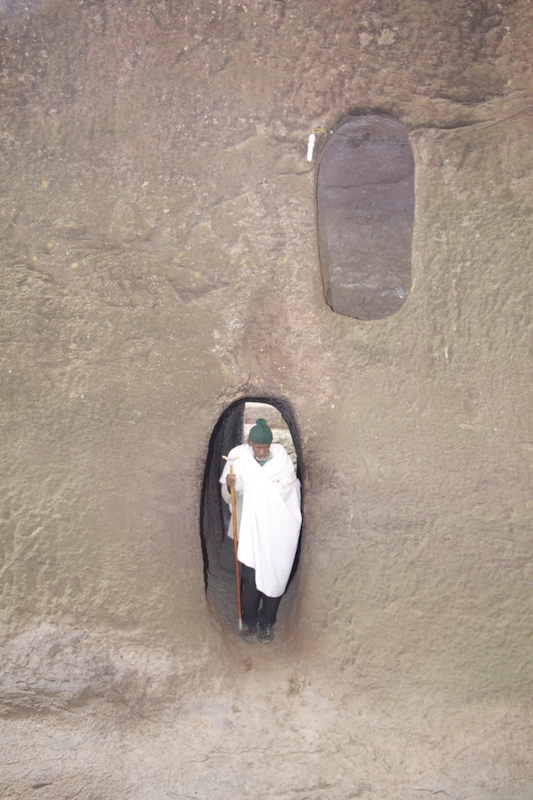 You've got to use narrow and steep defiles to access the churches to be able to reach their ground level. Sometimes, it is the other way round, and you have to climb steep cliffs using wooden ladders that look like they will collapse under you in the split of a second. From hell to heaven ... this is the "heaven end" with direct access to the church ... before, it is a 30m long walk through pitch dark darkness! 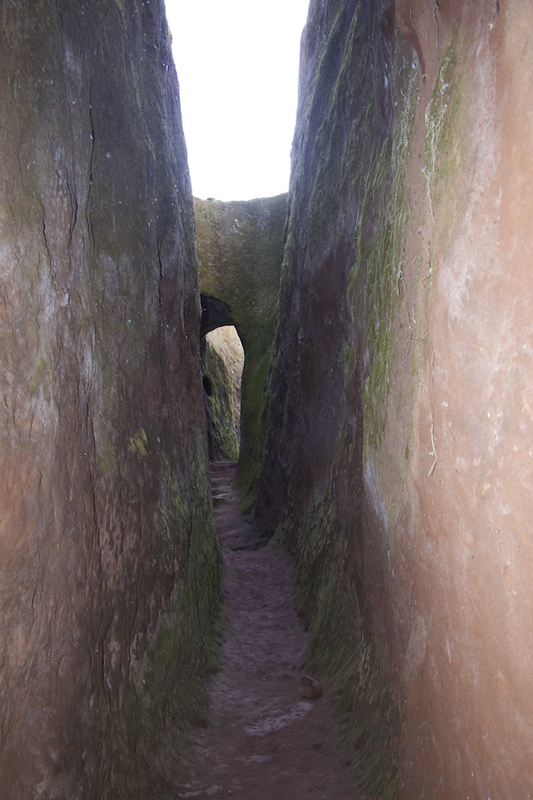 In Lalibela, some passages leading to the churches are very narrow and sometimes pitch-dark (a guide told me that that was planned, as the passage should symbolize going from hell, i.e. 30 metres under the rock in total darkness, to paradise, i.e. the church). 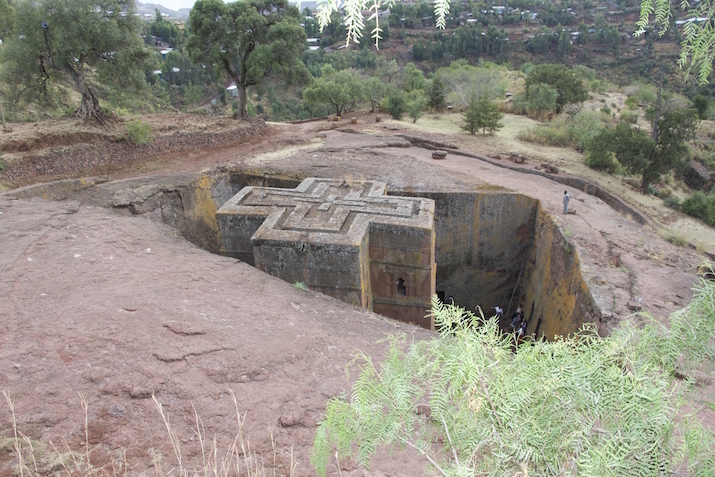 Bete Methane Alem, the largest church here in Lalibela and the largest rock-hewn church worldwide. 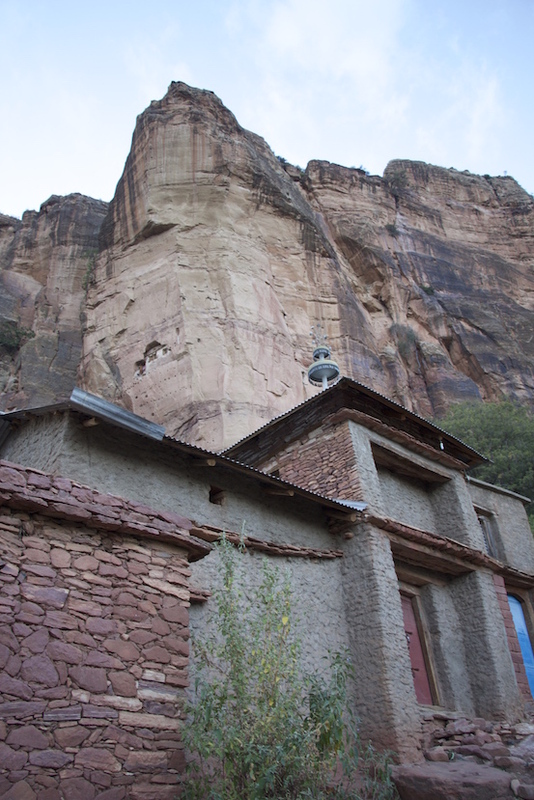 Bete Kiddus Georgyis - the most well known of the rock hewn churches ... impressively beautiful! 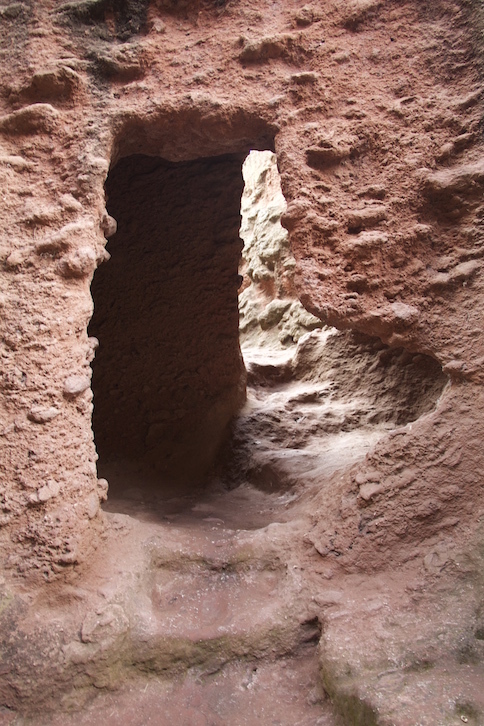 ... the "no window window"
Then, you stand in awe in front of an immense church hewn out of the mountain by hand and, after having taken your shoes off, you enter a completely different world of religious contemplation. It is a twilight world of silently praying shapes wrapped in white garments sitting on the carpeted floor and priests continuously humming their prayers. 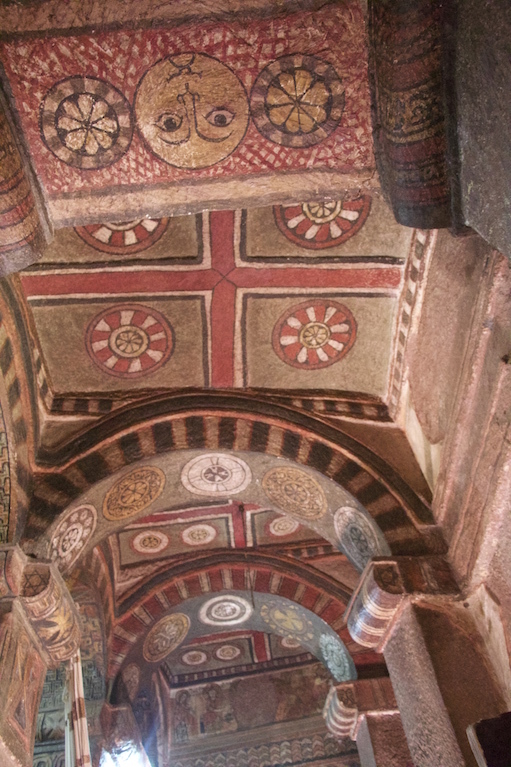 You go further in look in awe at the beautifully decorated ceilings while your feet feel the dust on the worn-out carpets that have been lying here for ages. Frankinscense vapours tickle your nose and candles burn in hidden nooks. 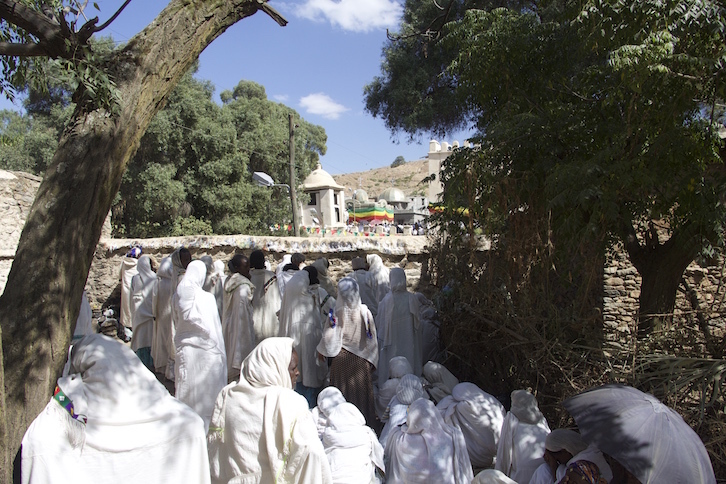 While you visit, Ethiopians continue to silently pray. 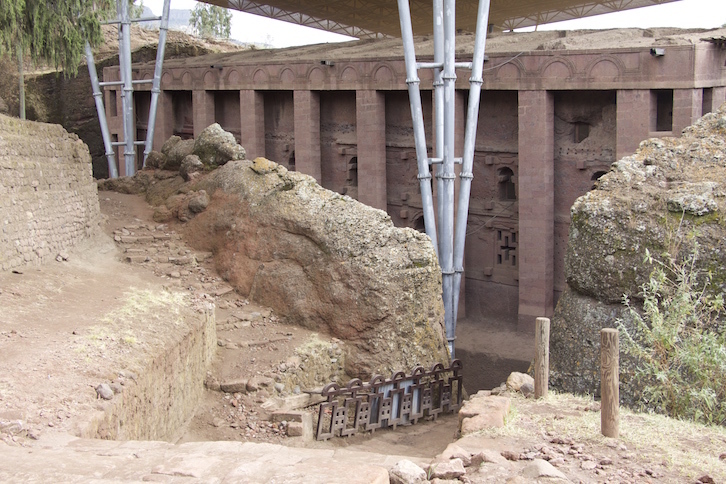 For us, it is really unimaginatively impressive how these churches must have been built, hewn right out of the hard rock by the hands of long gone generations of Ethiopians using only hammer and chisel. ... Was it the deep faith these people had that made them "construct" these wonderful pieces of architecture ... or was it fear of death and hope for a second life after death reached through hard work and praying? 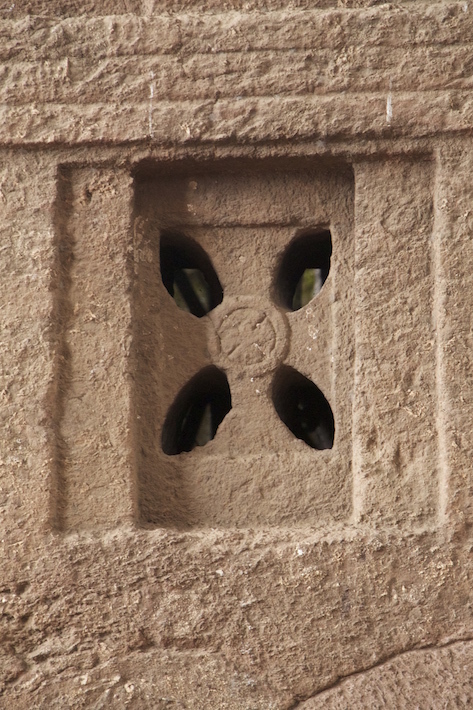 From a historical point of view, the churches were built between the 8th and 12th century. 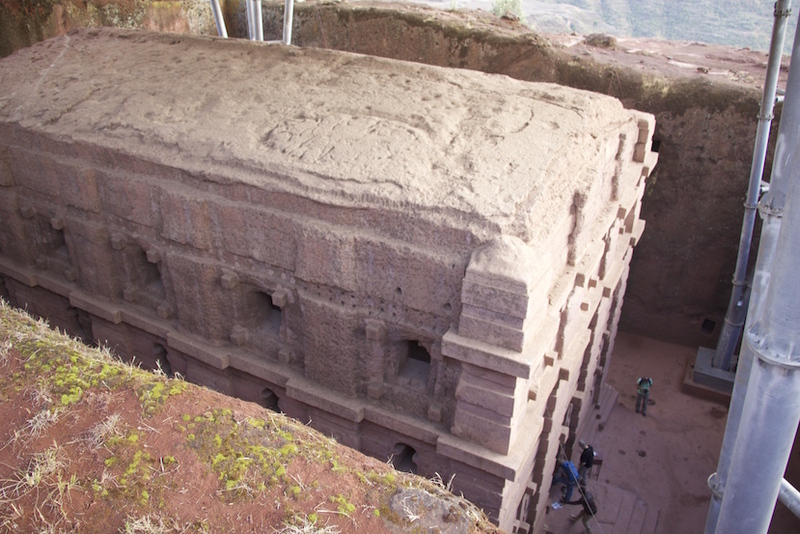 There are many stories about why they were being built, most of them named after the 12th century king Lalibela. He seemed to have wanted to create a new Jerusalem, because either he was not able to go on a pilgrimage to the Holy Land or he had to fled to Jerusalem in fear of persecution from his brother and vowed to build a new Jerusalem if he had the chance to return to his home country. 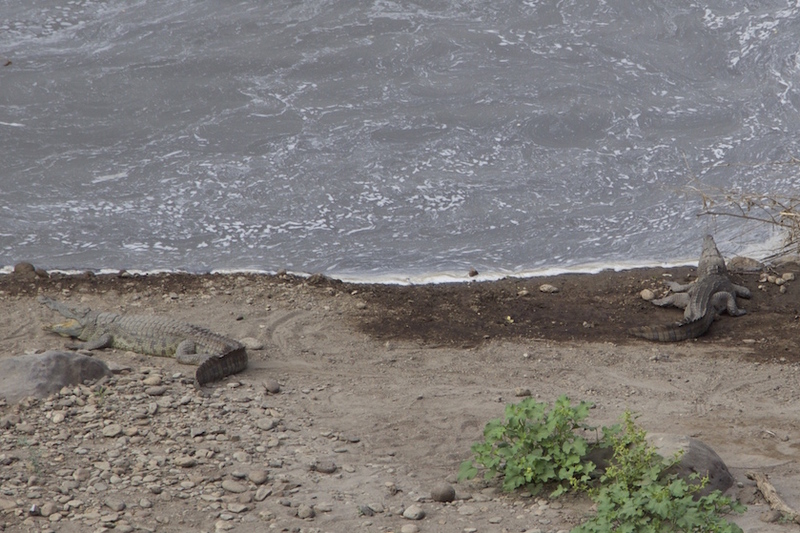 On our way down, we stay at the Awash Falls Lodge, a wonderful place overlooking the Awash River Falls where Nile Crocodiles are relaxing while you have breakfast. 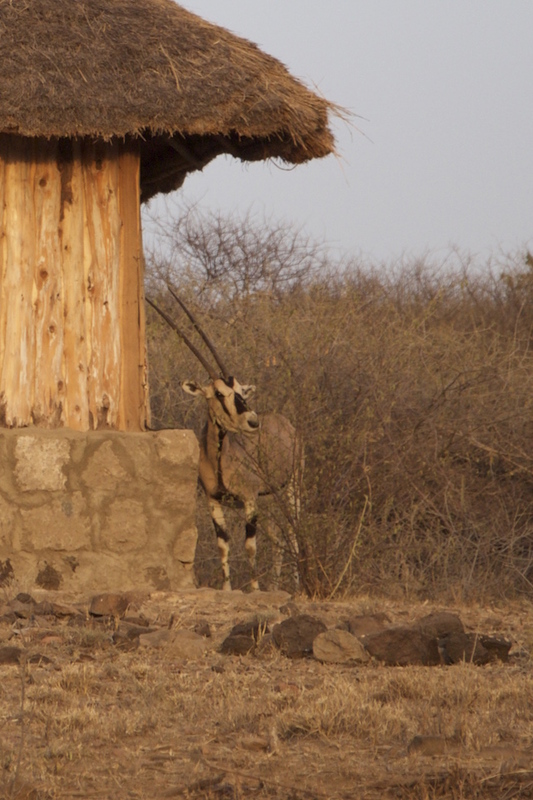 This entry was posted in Africa Overland and tagged Ethiopia on 24. December 2015 by Juliane und Mischa. "I hope that we will get old enough to be able to witness you coming back one day! 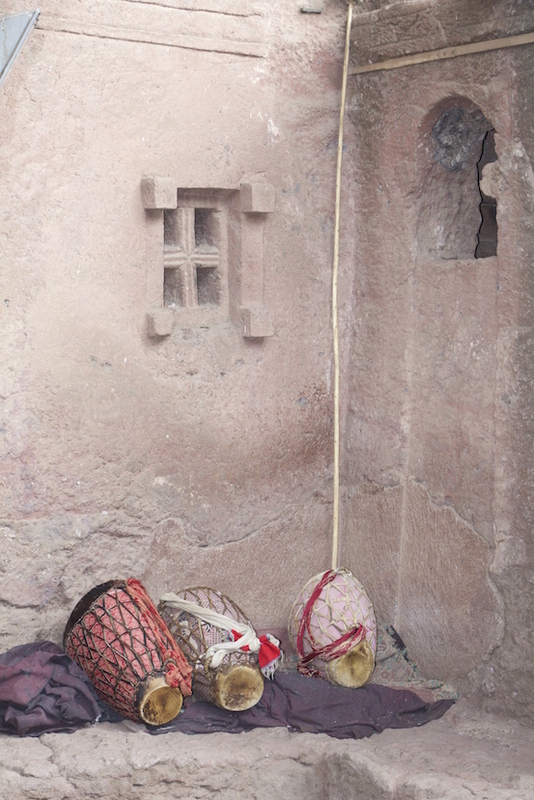 ", was what the village priest of Zik'allay said in his farewell blessing for us when we had to say "Goodbye!" for an indefinite period of time to the fastly embosomed villagers 10 months ago. 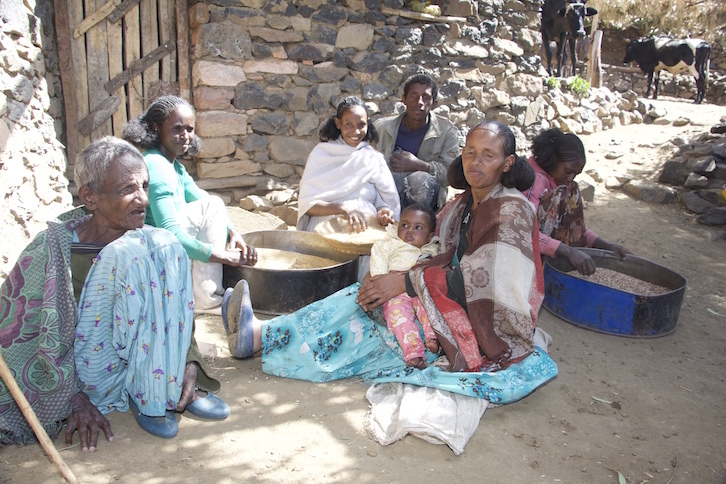 At that time, we had worked for a German/Ethiopian NGO in the northern Ethiopian city of Adigrat just a few kilometres away, further educating nursery school teachers. 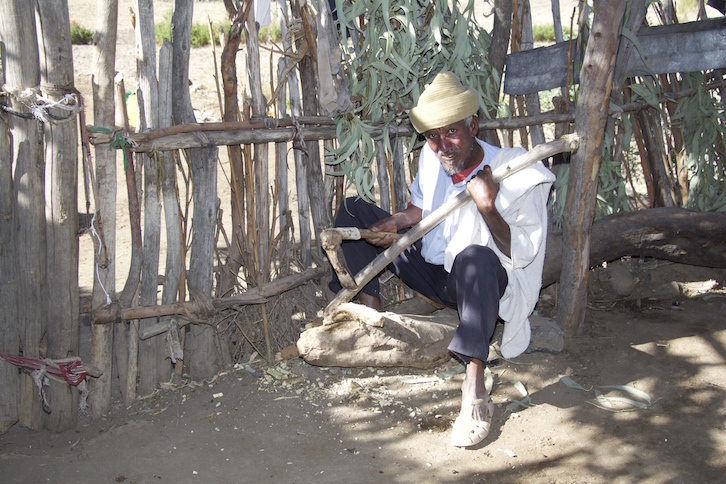 Hagos, the "country representative" of the kindergarten, who is teaching sociology at the University of Adigrat, took us to the mountain village Zik'allay where he was born and raised and where his family has been originating from for countless generations. Electricity, water from the tap or even cars do not exist here! 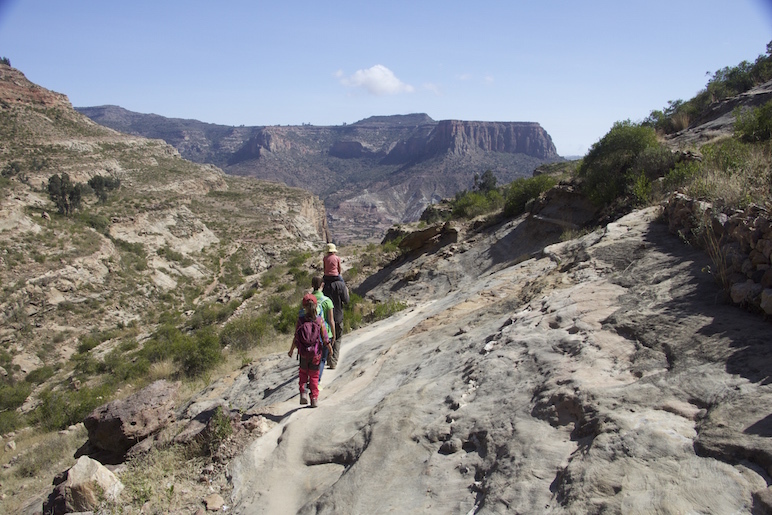 While our three hours' ascend with donkey-assistance the conditions of Hagos' way to school became apparent to us. And not only this ... read more in our post from winter 2014/15. 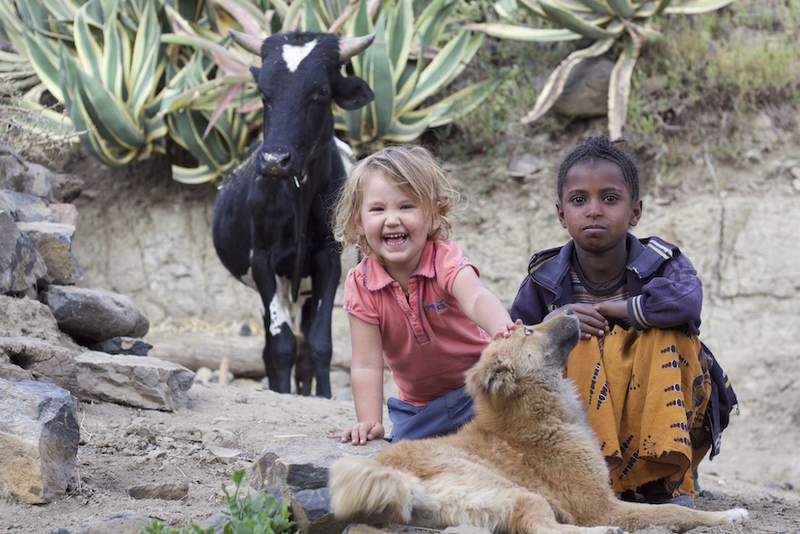 Hagos and many other people grew very dear to us during the time we spent in Adigrat and especially our two daughters Anouk (6) and Sóley (3) developed deep friendships. 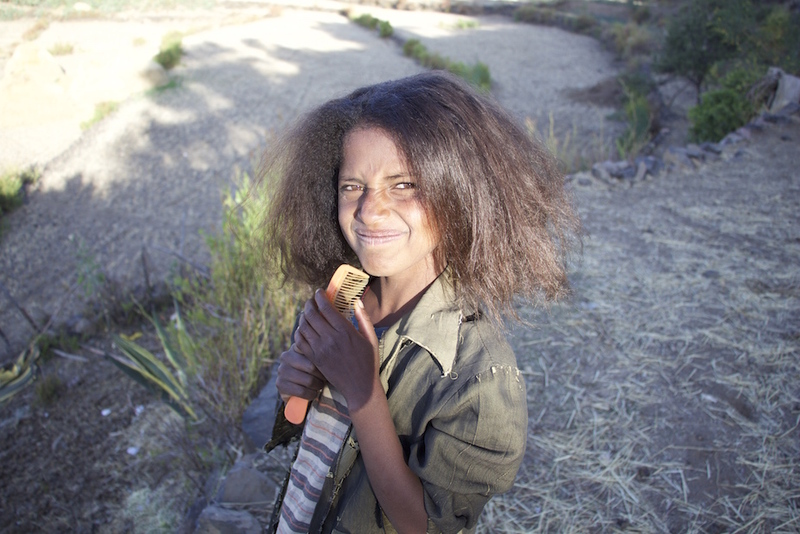 Anouk cried on the way to the airport in Mekelle. Never ever, she said, had she made friends so easily! Believe or not, these guys are old friends! Until that trip, our plans for the next following summer were "fixed": it would be a twelve months overland trip to South America. 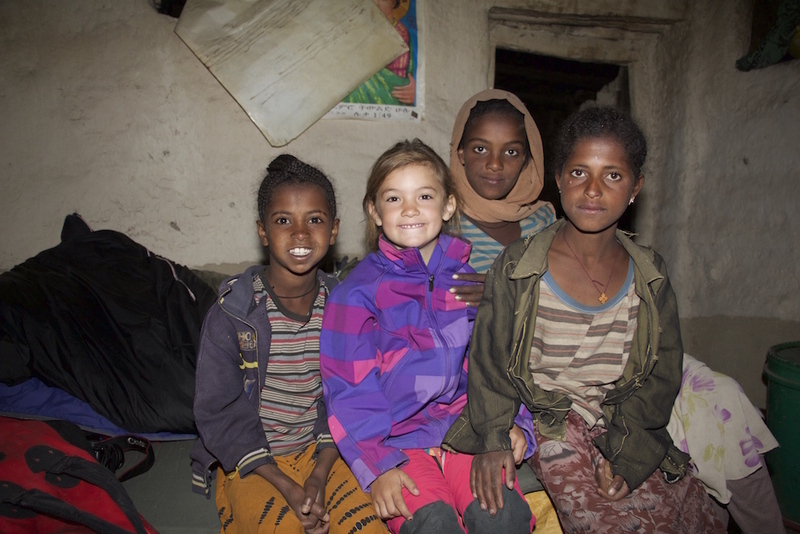 Meeting our new Ethiopian friends again seemed impossible, not only from a childs' perspective. 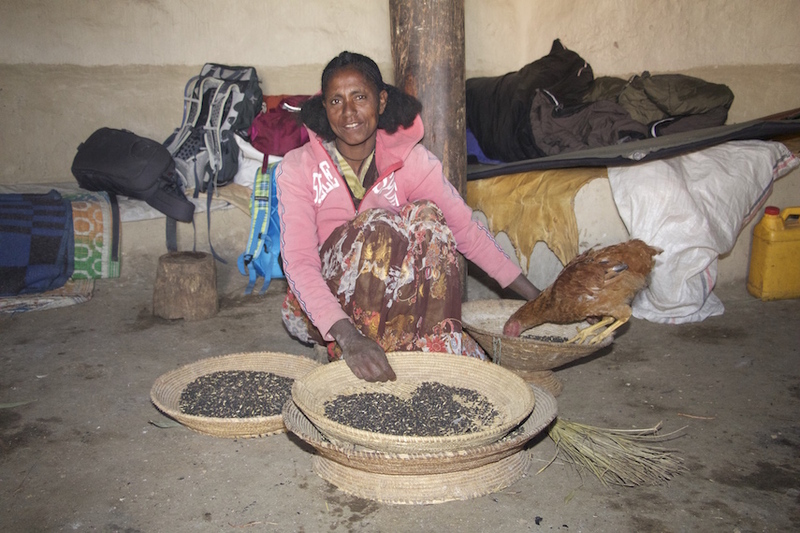 But that especially Ethiopia, being one of the most challenging countries in Africa in so many ways had been possible for us as a family with relatively young children really made us hesitate after having come back to Germany. 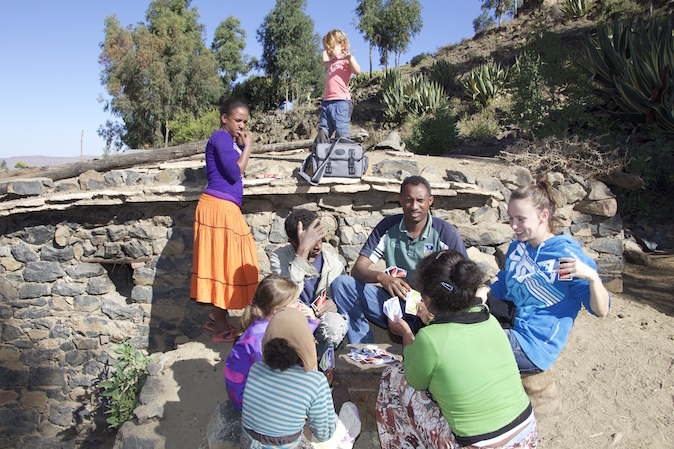 It was not only the magnificent and majestic landscape and the impressive culture, steeped in (human) history, it was definitely the many really warm personal encounters with Ethiopians - not least in the mountain village - which apart from the deep wishes of our children made us adults rethink our travel plans. After a virtual travel with friends in the "Klimahaus Bremerhaven" along all climate zones the 8th degree of longitude the new destination for our overland trip was a fixed plan: it was going to be Spiekeroog (Germany) to Capetown (South Africa) along the eastern route which had not really been completely traveled by overlanders going from North to South for a while until then. "Greaaaat! 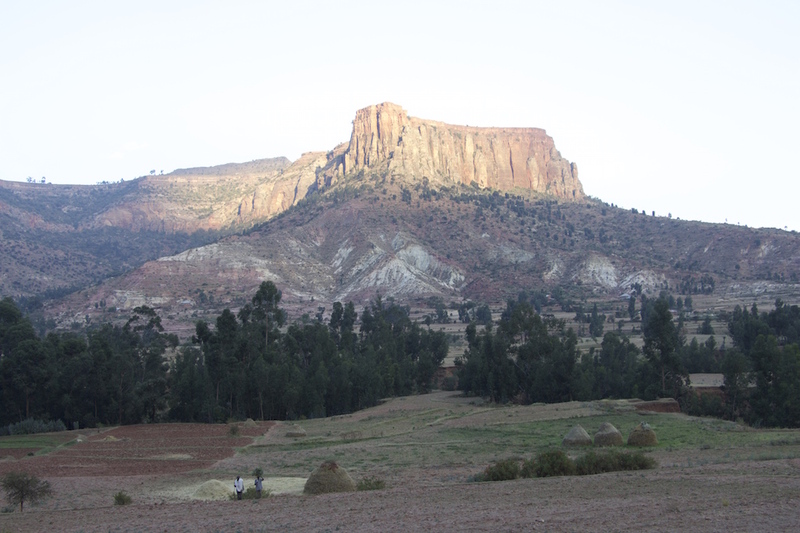 Then we can meet our friends in Adigrat and the mountain village Zik'allay again! ", Anouk and Sóley happily stated. And suddenly, there it was: a common decision on the travel destination for our sabbatical year which for our kids was not as "abstract" as traveling to South America, because they did not have any imagination of how it would be. Strong Anouk ... even carrying her own backpack! 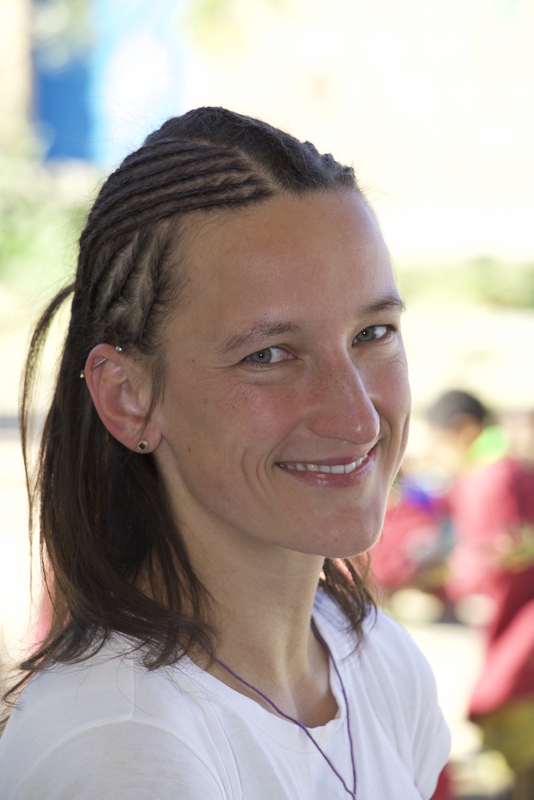 Especially Anouk's motivation was increased by that, which - now in November 2015 and back in Ethiopia during our overland adventure through northern, eastern and southern Africa - culminated in the fact that converted her thrill of anticipation into energy and motivation for the long and exhausting ascend to the village: this time she managed to hike all the way completely on her own, without donkey-assistance (and without cactus-acupuncture in the middle of the night like last time). Her iron will does not move the mountain, but it gives her perseverance, which she never had until then and which makes both us and herself immensely proud. 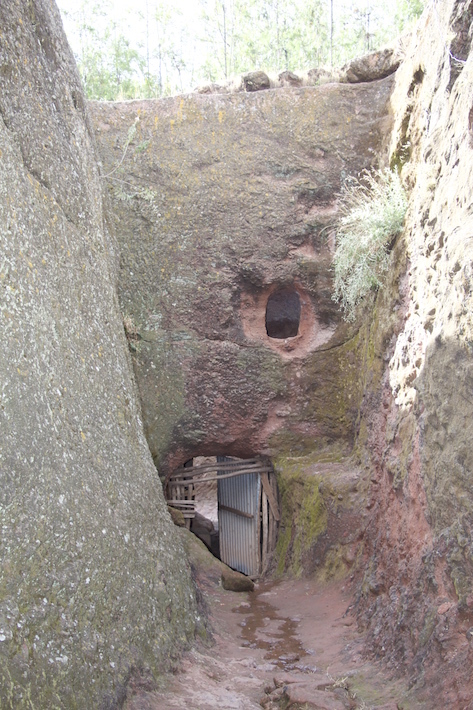 Do you find the rock-hewn church in the cliff wall? Again, we wander into the magical mountain darkness. In the mountain village we are not received as the "foreign" family who has the courage to travel up here, but as family members everybody is happy to meet so unexpectedly soon. The small presents we take up here are more suitable this time as well ... the very few things the villagers do not produce "up here": coffee, salt and a bottle of locally distilled "Ouzo". Apart from that, we also bring paper copies of the villagers' portraits we shot last time which cause a lot of cheerfulness and laughter. 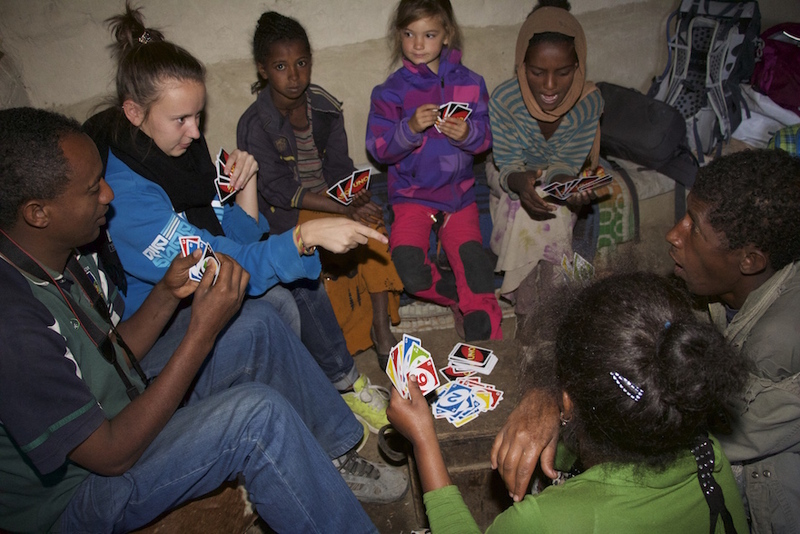 Anouk brought a new deck of her favourite card game UNO which does not only attract the children of the village: just like at a family celebration of a big extended family, children and adults alike are gambling round after round in spite of all language barriers. 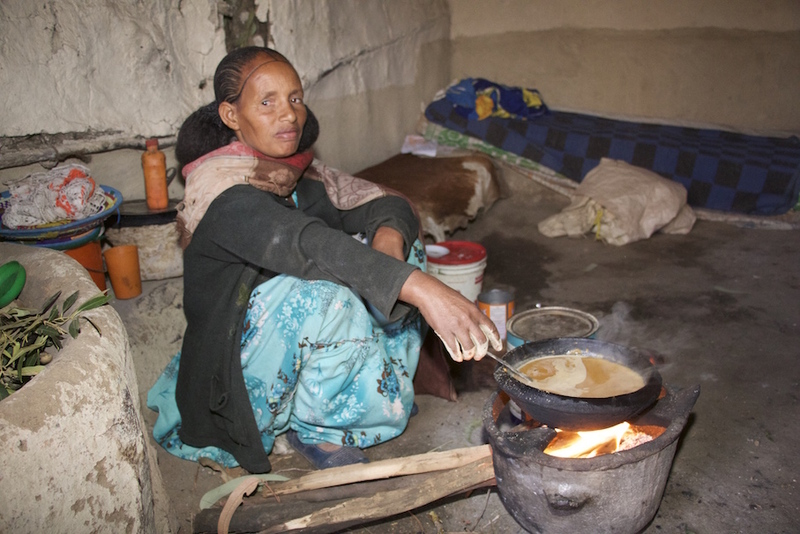 After having dinner together - as usual it is Injera from a commonly shared plate - we sleep in the kitchen of the farm, the oldest part of the 1,500-year-old farm building owned by Hagos' family. There is not much privacy but instead there is the smoke from an open fire in the middle of the room, farmyard smells and animal noises and so very much cordial gregariousness. For hundreds of years, people have sat together here, shared food and stories, have quarrelled and loved. Oh how wonderful it would be if those adobe walls and beams would be able to tell all the stories they have witnessed over those many years! After a long and relaxing time breakfasting, dreaming and talking (... and countless rounds of UNO! 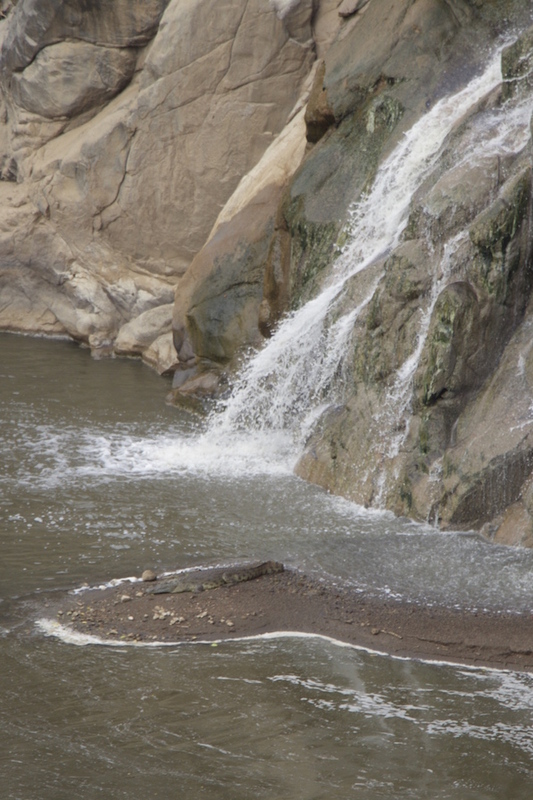 ), we go on an excursion together with Hagos. 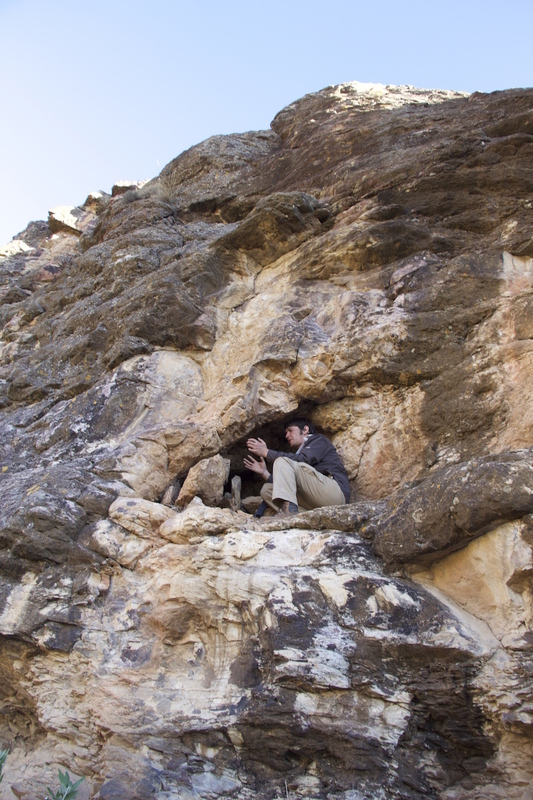 Last winter we found a secret cave full of human remains. 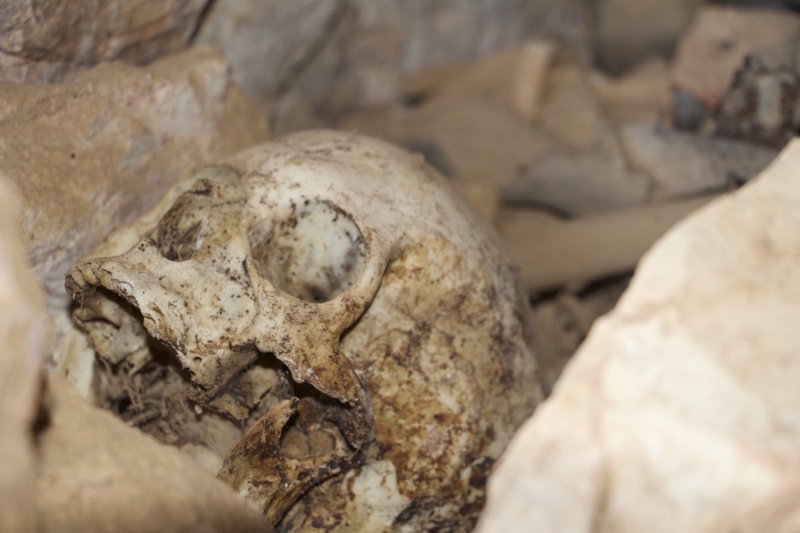 One of six human skulls in the cave ... it would be great to find out about the background! 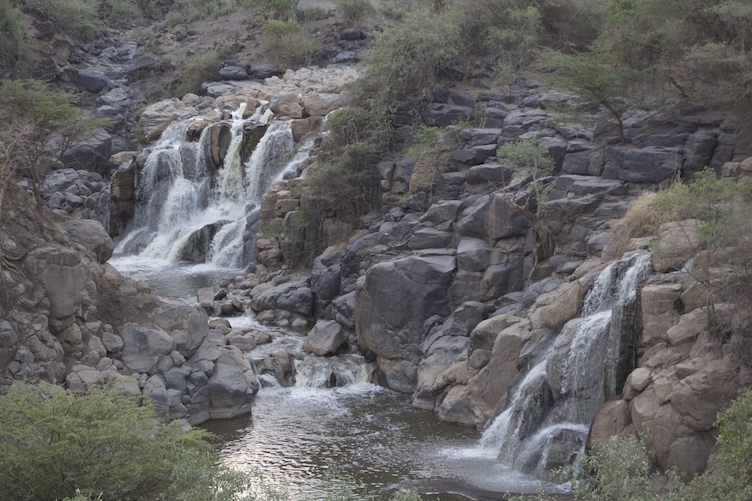 Last year Hagos and Mischa had explored "Mundugu", the "enchanted" part of the mountain guarded by leopards and had discovered a cave here containing the remains of at least six humans. 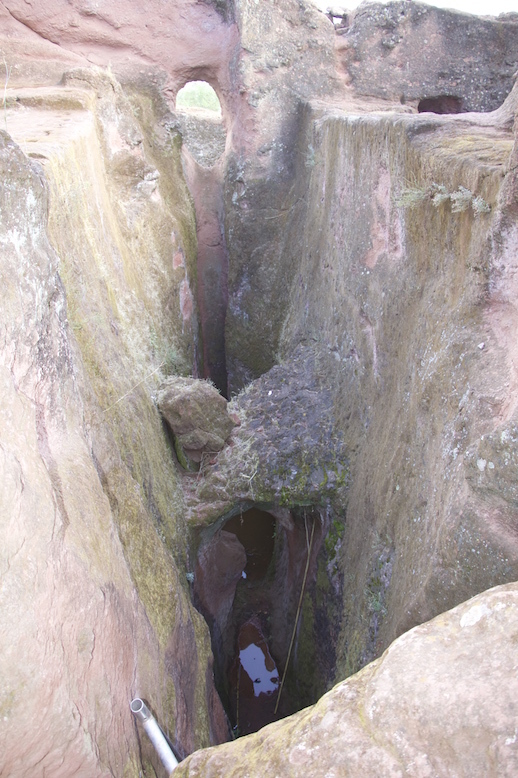 This part of the mountain and Zik'allay as a village is deeply connected to the stubborn and rebellious monk Stephanus, who at his ordination did not accept bowing down in front of the emperor to receive his blessing because the emperor is a human just like Stephanus and certainly no person nearer to God. 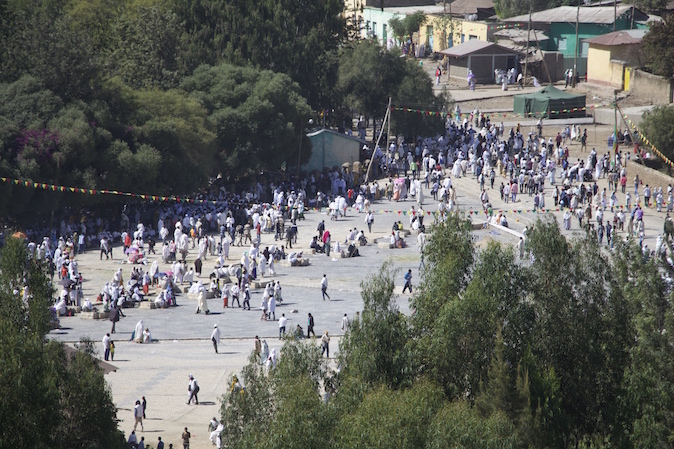 A long persecution by the official Ethiopian Orthodox Church and the state was the result of this disobedience. Later on Stephanus demanded the separation of state and church and also demanded that clergy and monks farm the products they need instead of taking half of the annual harvest from the poor farmers as church tax. 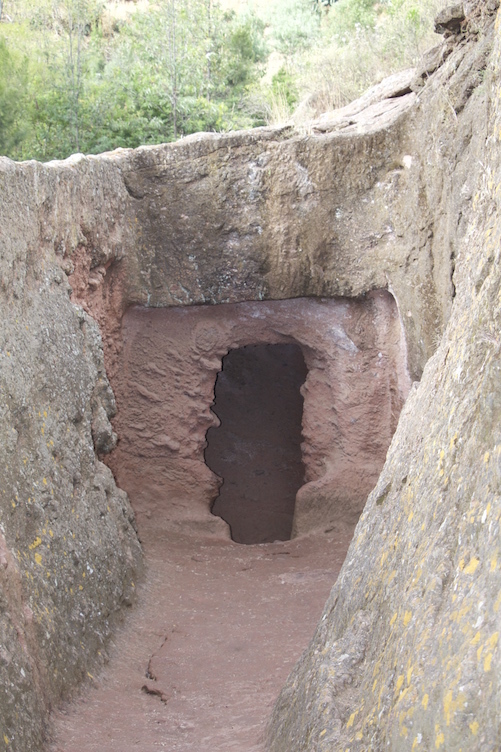 The family's ancient cave dwelling. 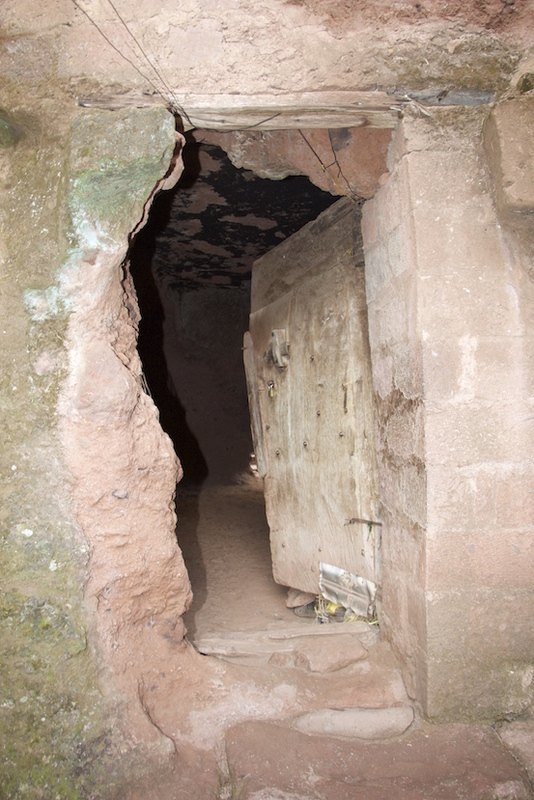 This year we go to "Be'ati Goitana" ("the cave of the lord"), the old cave dwelling of the family, which had been used as the family home until about 1,600 years ago for about three to four hundred years, but was still used every now and then in the time of Hagos' grandmother to produce certain home made products or for storing money and other valuables in times of insecurity. 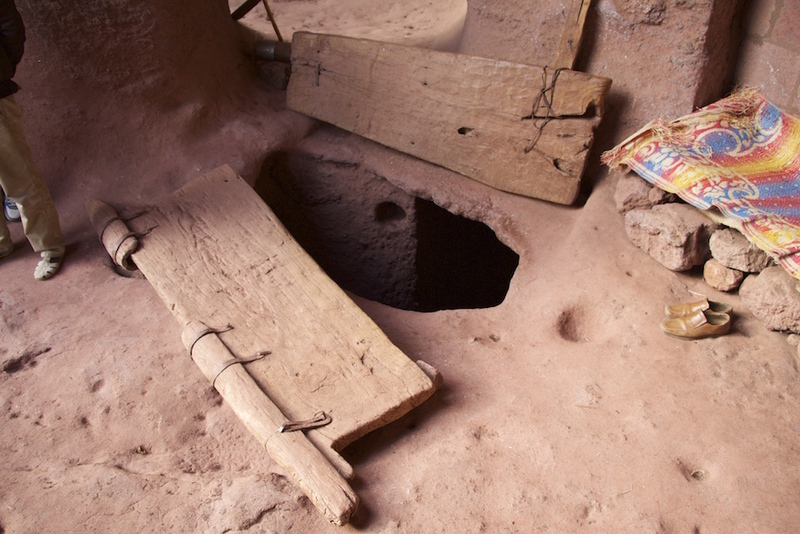 Still, just like more than a thousand years ago the well "May a'Ewaf" ("the water of the birds") in the middle of the cave's kitchen provides fresh spring water directly from the heart of the mountain. With wide-open mouths we try to catch water drops falling down from the stalagtites hanging from the cave's roof and listen to the family-stories Hagos is reciting. "About 2,000 years ago, a man from this region came here and built the first settlement on this mountain. He was with his wife who came from what today is Yemen and their son. After a while they separated and he married new, this time a lady with Jewish descendancy. With her, he had another son called "Shum se Essad" (governor of the fire), the first family ancestor known by name." Again, we are impressed by the long orally transmitted family history. 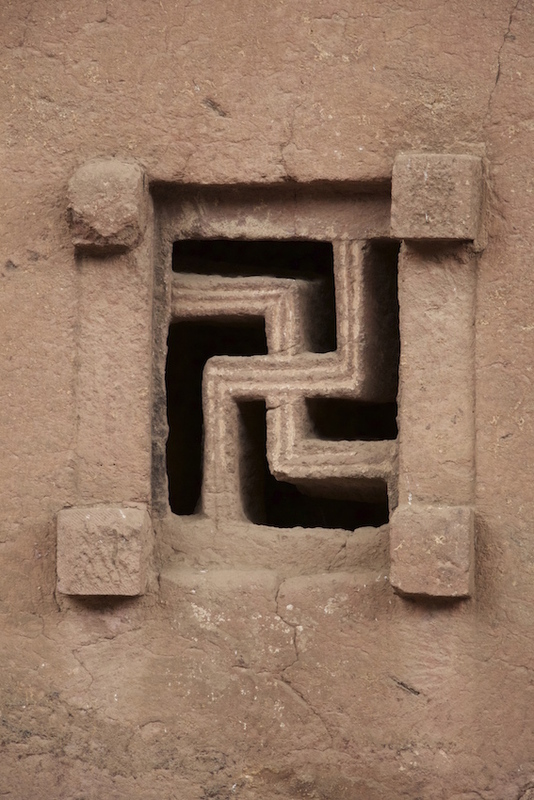 History is old here and the people have a close connection to land and ancestors, something that has unfortunately mainly been lost in the cause of individualisation and modernisation in our "developed" world. Again, we take in the breathtakingly beautiful view from the mountain plateau down into the canyons deep deep down below us which is really ditching Grand Canyon. We enjoy and take in the relaxed atmosphere of life in the mountain village ... everybody just follows their everyday work but still has a lot of time to chat with us or simply laugh and enjoy. 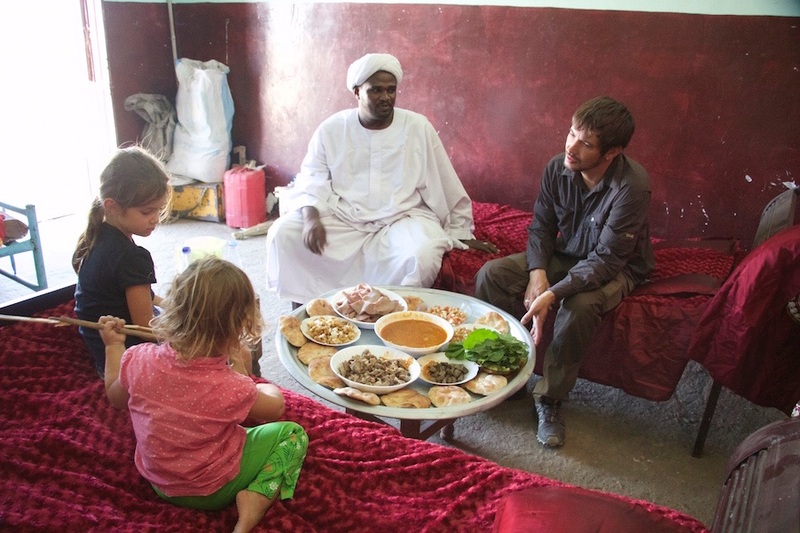 In the afternoon, we are visiting the neighbors together with Hagos' family members because they just recently married. It is the tradition that for the following thirty days all the neighbors, friends and family members are invited to celebrate. 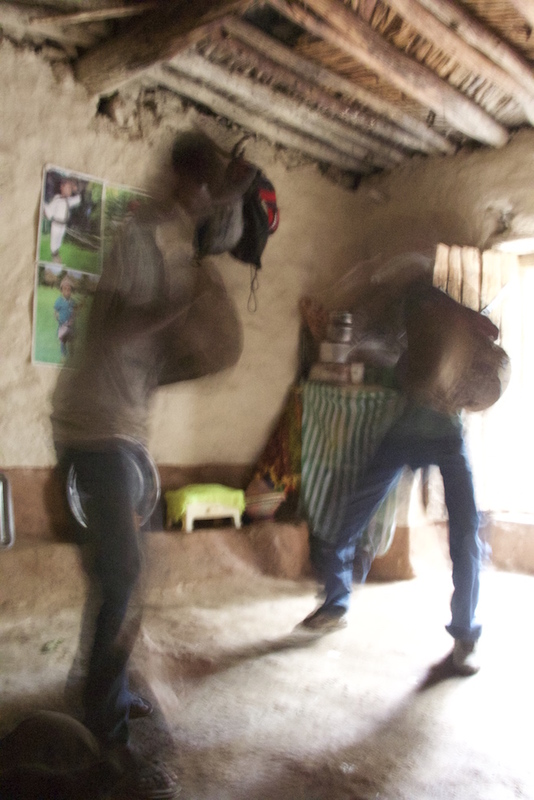 We are sitting in a dark room, drink "Suwa", the home-brewed sourly-refreshing beer common here in the Tigray province and on the party goes. With several drums the friends of the newly weds dance around the room and sing newly invented songs in tune to the drums. Again and again, we hear our names all the while the other listeners smile a bit embarrassed. Supposedly because they think our names sound so funny, but we are sure that there is something else behind it as well. But here everybody has the ability to laugh about themselves! Our daughters get sweets and their fingernails are being painted in glaring colors. Cheery and tired at the same time we go back to our "home" and enjoy the wonderful evening mood in this world so different to ours. Heavy heartedly we leave our friends after two nights. Again, especially Anouk is so very sad because she would really like to stay here a bit longer and could maybe even imagine staying for ever because she so very much likes it here - apart from the food here in Ethiopia which our daughters do not really like. Still we guess that Zik'allay is in so many respects a happy "island" in Ethiopia, not having known hunger, famine and other major human problems for hundreds of years. Diseases of civilisation are not known here but still the medical support is a big problem and issue here as many mothers die while giving birth or during childbed. 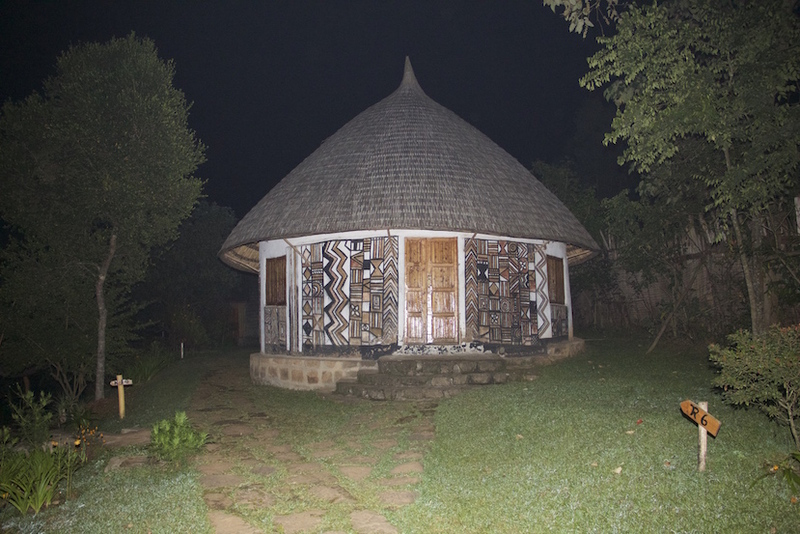 Because of that Hagos thinks about ways to be able to build a small clinic for the village which might be financed with the help of a small tourist lodge owned by the village community. ... when will be come back here next time??? 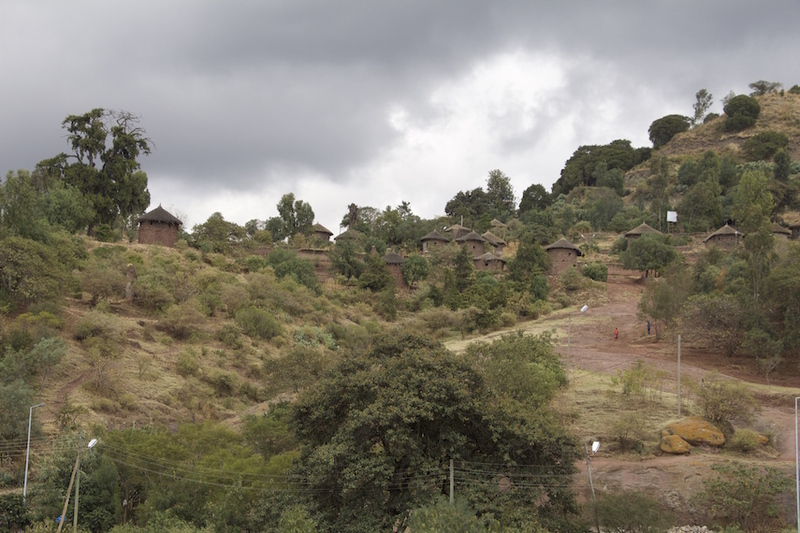 On our further journey through another 2,000 km of Ethiopian roads we will have to experience that the mountain village Zik'allay is only the "romantic paradise village" of Ethiopia. The "life along the road" shows different faces and flushes in queer and nasty noises with the sreams "Youyouyou!" or "Moneymoneymoney! ", which makes the people you meet so very inapproachable compared to the people up there in Zik'allay. 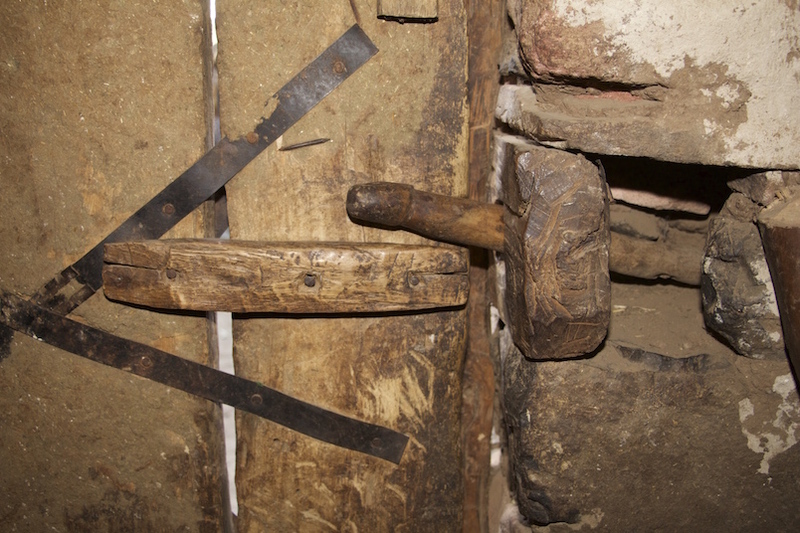 .... eehm, yes, we did not ask ... but that's the way they lock the main door of the farm building! 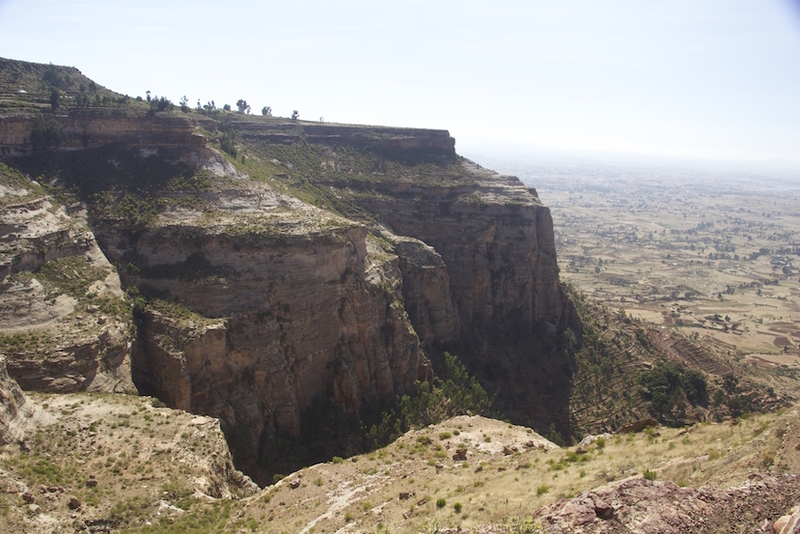 This entry was posted in Africa Overland and tagged Ethiopia on 23. December 2015 by Juliane und Mischa. 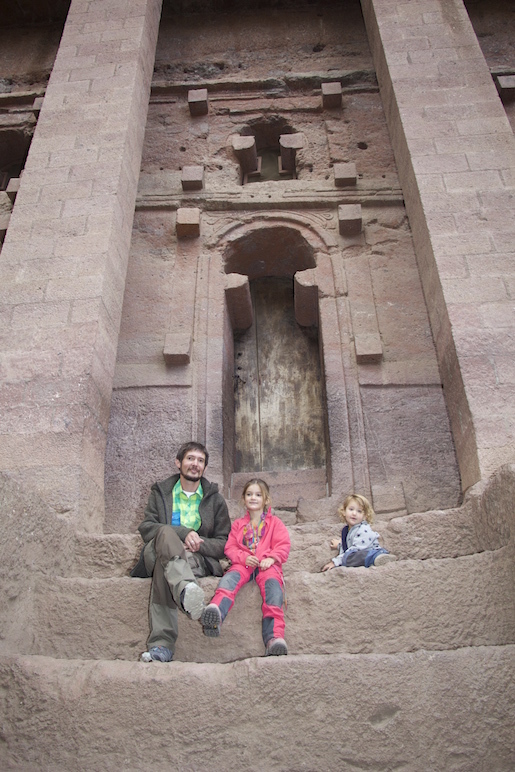 Being parents traveling with young children and educational scientists at the same time, we publish our thoughts on education, children and world travel every now and then. 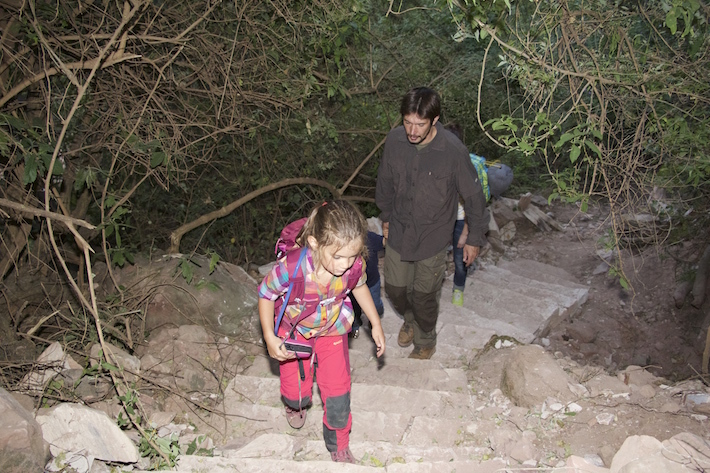 Our first two pieces on that subject we published on Expedition Portal, "Overlanding With Kids - Going beyond "normal" education" and "Age is just a number!" Everybody knows the situation: one is traveling in a different country or spends time with people from a different cultural background and suddenly is confronted with absolutely "strange" behavioural patterns in everyday situations, which give rise to a feeling of being amused or sometimes even of being disgusted. A lot of people fear "the strange", they fear behavioural patterns which seem inexplicable at first. Many even fear the very people acting that "strangely". Why does this stereotypical thinking exist and in what way does it affect traveling families? Actually it is exactly this pigeonholing which has been so very important in the human evolution. The prehistoric man had to differentiate and inescapably decide very often between concepts such as "This is dangerous!" and "This is not dangerous!" or between escape and attack. If and when these experiences were repeatedly observed they became concepts, "stereotypical concepts". No place to sit on the toilet - dirty or rather cleaner than at home?! Children need exactly these concepts in their first few years to become socialized in their home culture, both when it comes to everyday life in their native family (i.e. the family sub-culture) or when it comes to communally agreed on concepts in a wider range. 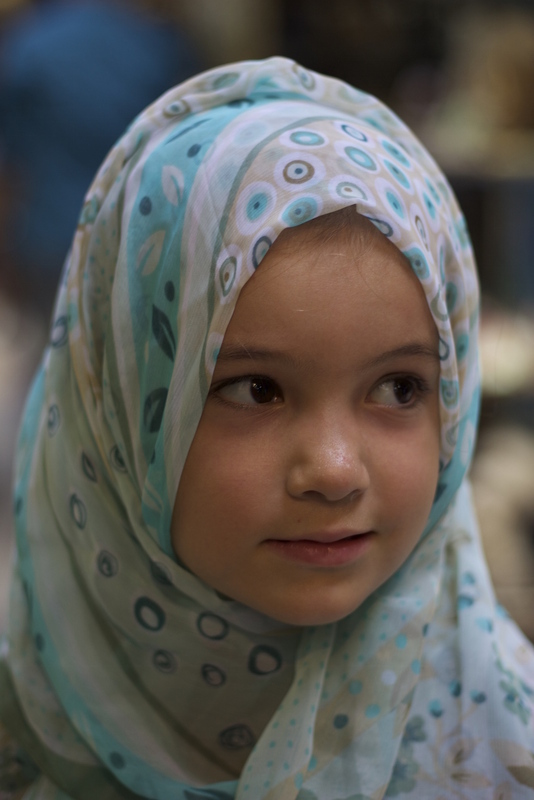 For children, these concepts provide orientation in their culture and also security. Both aspects are immensely important for the children's first five or six years after birth and they provide time and ease to enable them to find themselves in this field of socialization and for them to be able to develop their identity and self-consciousness. Long-term-travel-with-kids-critics might now use their chance and argue that exactly the arguments just stated speak pretty much against long term travel with (young) kids from a sociological and developmental psychological perspective. 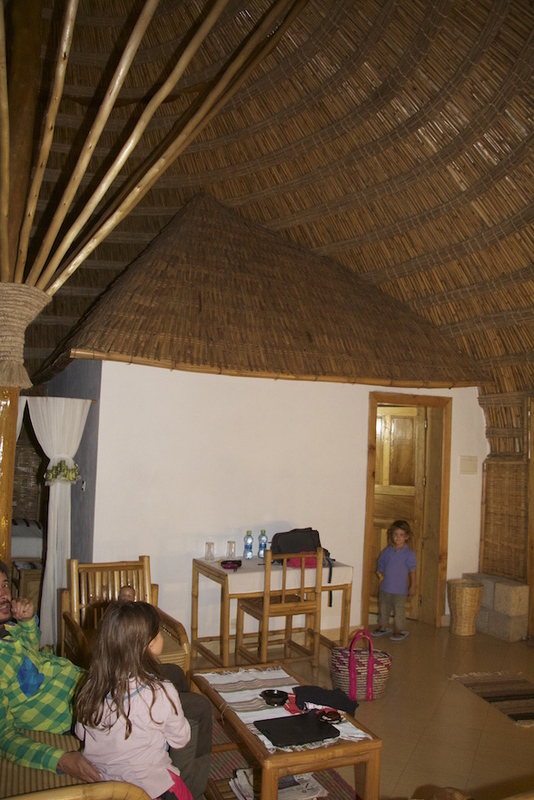 We, however, experienced exactly that differently during traveling with our children. 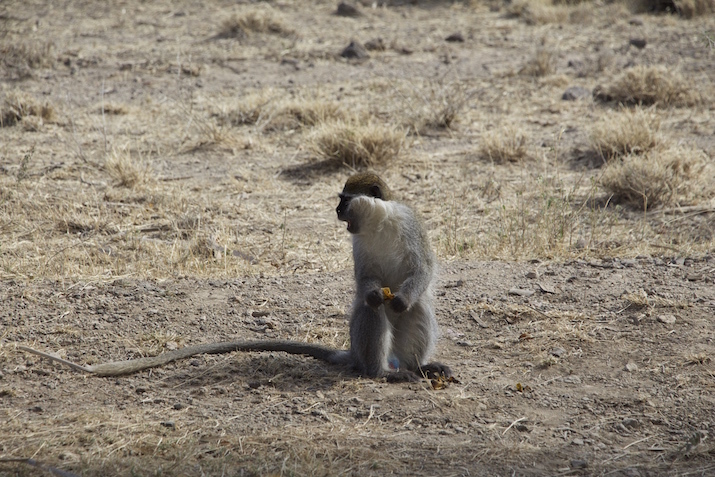 After having experienced the eating habits in Africa, eating with the right hand from one commonly shared plate, Anouk on the flight back from Ethiopia last winter used her right hand to eat her pancake with apple sauce. 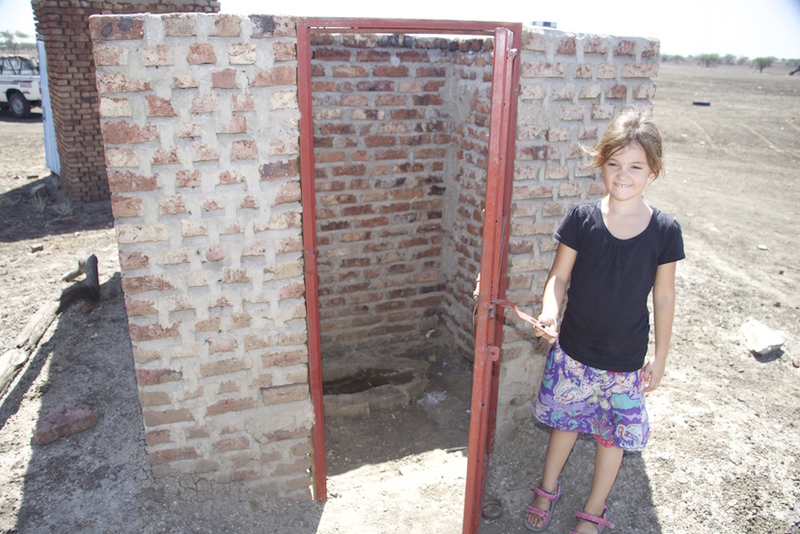 Of course, our kids discover cultural differences, be it the toilet without a proper seat and without toilet paper in southern France, on the Balkans or in northern Africa, be it using hands eating from one commonly shared plate in Africa, different hair-do styles in Ethiopia, different styles in clothing and many other aspects. For us these perceptions of parallel worlds and different ways of seeing "reality" have always been food for thought and inducements of communication, because children, naturally born explorers, ask frank and freely as soon as they discover things and patterns of behaviour strange to them. These questions are constant challenges for parents to inform themselves on the background of their children's discoveries and create chances for conversations in which on the one hand the meaningfulness of different behavioural patterns can be discussed (and so very often be discovered), but in which on the other hand we become aware that and why we do things differently at home in the children's native culture. 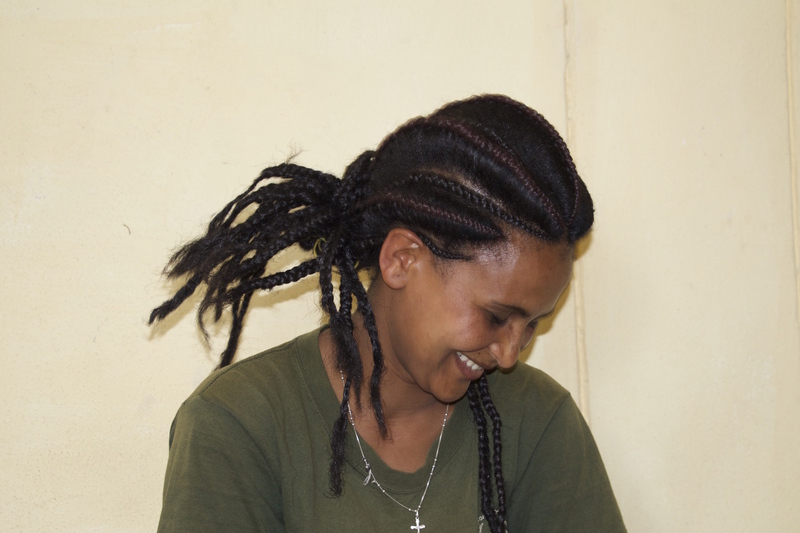 In Ethiopia the hairdo is part of the cultural identity showing which part of the country you are from! 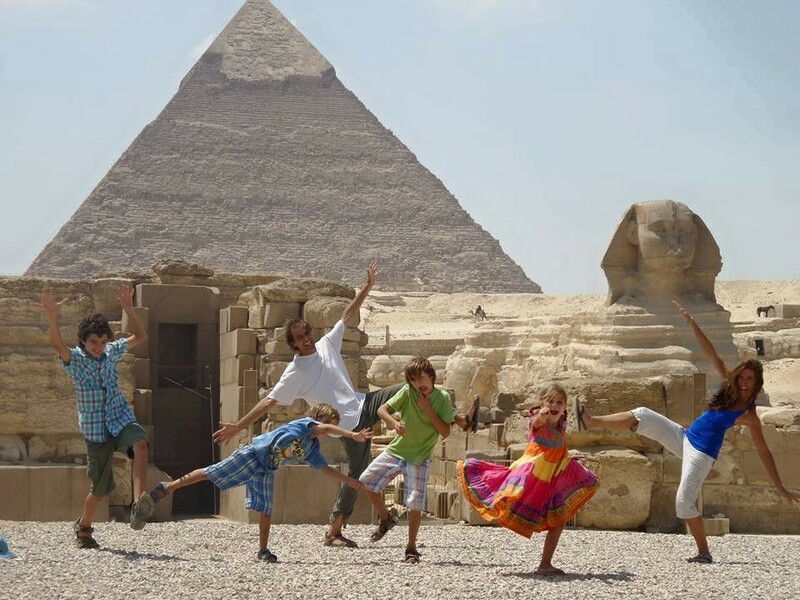 When in Rome (or in this case Egypt) do as the Romans do - that's part of the experience! This shows that traveling is not causing "cultural loss" in children (as some of our relatives had assumed before we set off for our recent Transafrica trip), but a matter of learning about different concepts, a matter of self-reflection and questioning what is behind ones' own culture. In this process children (and adults!) discover and most surely also understand also their own cultural identity. In East Africa such as Ethiopia and Kenya, the hours of the day are measured differently: at sunrise (six o' clock), it is 0 o'clock, at midday it is "6 o'clock" and when the sun sets, it is "12 o'clock". After six o'clock p.m. (European time), it starts again and midnight, it is six o' clock. Parallel to that, we hope that through this experiencing of different realities and different approaches to common concepts our "travel children" will develop an understanding that there nearly never is just one "right", one certain approach to something, but that manifold and indeed comprehensible different cultural norms and behavioural patterns co-exist next to each other. In many countries, where homosexuality is strictly forbidden and even punished with a prison sentence, men who are good friends hold hands in public - something that might be seen totally different in many western countries which are relatively open when it comes to homosexuality. This openness is at the same time an important "weapon" against any kind of racism and xenophobia which will support the idea of a meaningful "world citizenship", because the "pigeonholing" learned in the important phase of socialization is constantly used by politicians from any kind of political side and in all countries on this planet to divide and rule people by creating fear and influence them to act accordingly. In Muslim countries, the weekend is not Saturday and Sunday, but Friday and Saturday. Even European schools in Muslim countries follow this pattern and so Sunday is a regular schoolday! Parallel to an openness for other humans, cultures and concepts the children learn that there always are various different approaches to a solution, which will most certainly lead to a higher flexibility and creativity in the processes of finding solutions to problems, which then can positively affect success both privately and jobwise for the coming generations. Finally, it is also the discovery of the many things people everywhere on this planet have in common which is so very impressive but also reassuring at the same time: the children discover that in all cultures, in all countries, the concepts of humanity, love, need of family and friends, of shelter et cetera exist. The predominance of these basic similarities in comparison to the rather superficial differences clearly states how similar people from different cultures and with different skin-colours are and how abstruse in contrast to that wars and conflicts between cultures and countries are, bearing in mind the substantial common grounds. In addition to all these aspects stated so far, we will have to question our "western way of living" in these important conversations with our children. They also discover how "Coca-Colonized" people have become worldwide, how many western products are accessible globally for western prices and how modern "mobile-mania" using smartphones and the yearning for western products and TV-culture changes cultures and reduce our common wealth of worldwide cultures year by year, day by day. This helps creating a political awareness in the coming generations which hopefully will later on lead to trade and communication on an eye-level base. Still, it is clear that traveling with children simply is difficult and challenging sometimes. All those new experiences can cause fear every now and then and it is the parents' job to react fastly and confidently to the children's emotions and experiences and provide support again and again. We experience this day by day when our kids try to get our attention - not always the way we want it! At the same time, completely unexpected problems arise, such as eating and drinking habits, because of course our children expect to be able to eat exactly the food they know from home, instead of always adapting to new types of food, spices and drink or always having to eat pizza, French fries and pasta. ... Here as well, parents have to deal with challenges and provide a safe harbour for their children. 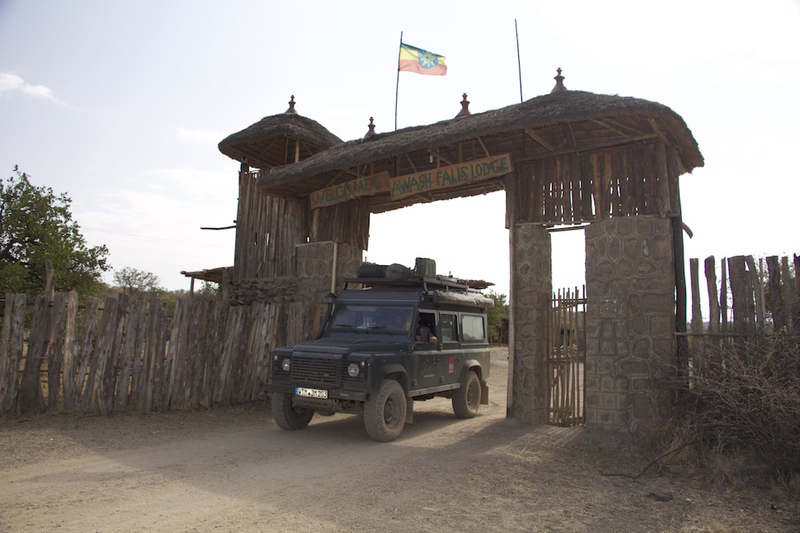 This entry was posted in Africa Overland, General Info and tagged Travel School on 15. December 2015 by Juliane und Mischa. 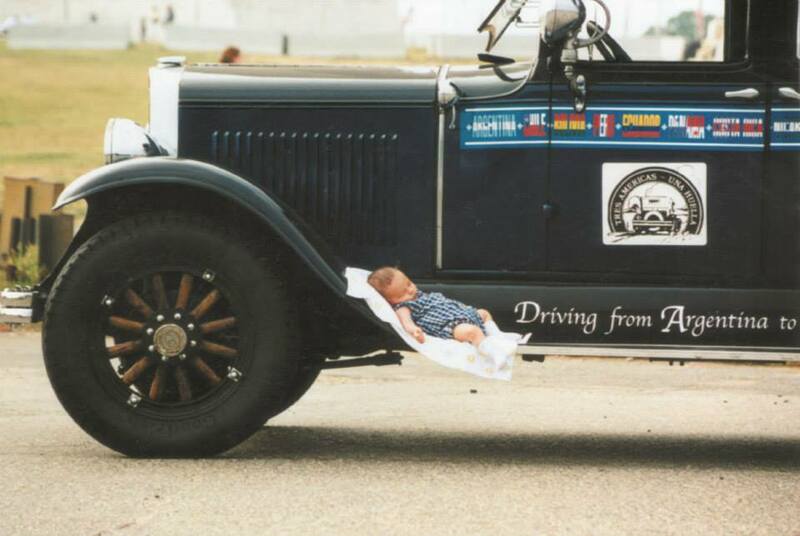 An Interview with the Zapp-Family … on the road for 15 years in an oldtimer car … with their four kids! 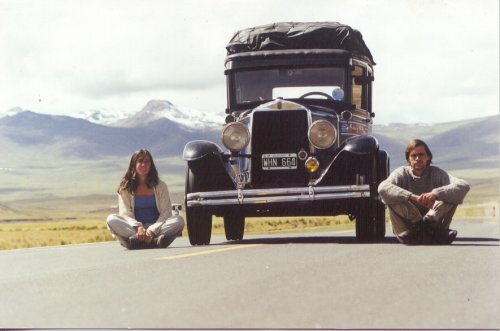 For some time now we have been in contact with the Argentinian Zapp-family, traveling the world in their 1928 oldtimer car with four children, all born while traveling. We have been supporting each other with up-to-date information and through establishing contacts in the countries visited. 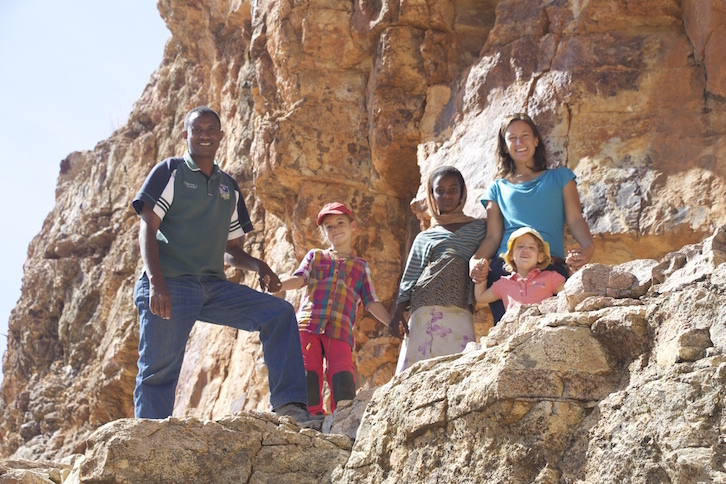 This really is a wonderful thing and many overland families are connected in this way - across all language barriers or other differences! The Zapps have spent the last three years in Africa going up north along the eastern route and we are on our way into the opposite direction - from Europe to southern Africa. Unfortunately, we did not meet the Zapps at common friends' in Cairo as planned because our visa did not allow us to do so ... Thus, we had to interview them by internet. Hermann and Candelaria 15 years ago. 4-w-n: Since when or whereby did you decide to go on traveling for an indefinite period of time, or was that the plan right from the beginning?" The Zapps: Of course not!!!!!!! Imagine to think about it ... it would be impossible! ... What about money, family and kids?! ... We always dreamed to have kids ... and having kids on a journey ... was not an option! ... We just left to go just for a six months' journey. And it already took so much time for us! But the journey little by little was changing, changing us as well! We started to see things differently ... and we found ourselves doing what we always dreamed to do and enjoying it a lot. ... Then we felt the necessity to share it with our kids ... and they came along! 4-w-n: Many families with small children abstain from camping and overland trips, especially to countries far away from the normal tourist routes. What are your most important motives for doing exactly this? Is traveling this way not rather burdensome? The Zapps: As we said we want to share with our kids the beautiful world we live in, the most beautiful world in the universe. 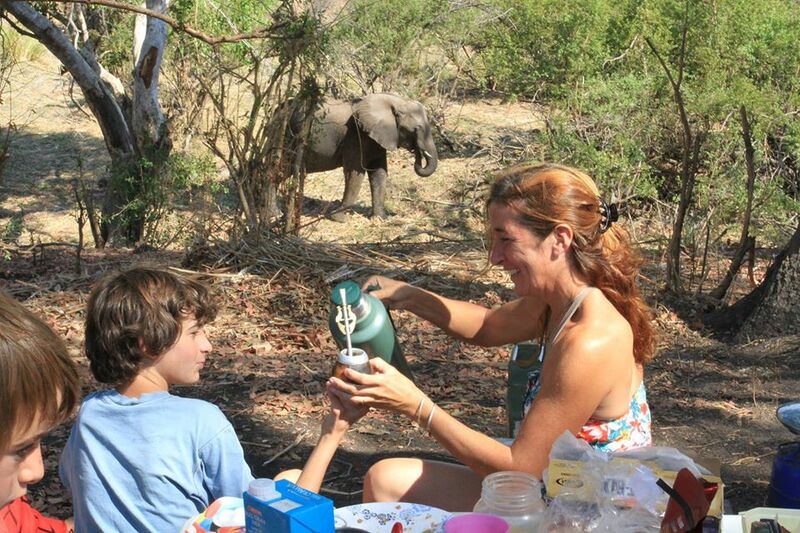 4-w-n: Do you meet many overland families on the way? In how far do your own experiences match with theirs? 4-w-n: For the last 15 years, you have been living your dream ... does traveling and thus this dream become a routine like any other "job"? ... How do you manage to make sure it is not becoming just a different type of "job"? The Zapps: Can't remember a routine in the last 15 years ... We are not in a job we are in a dream. For the last 15 years we have been living our Dream. 4-w-n: How do you earn money? Do you at all? Or did you find another way that enables you to continuously travel? 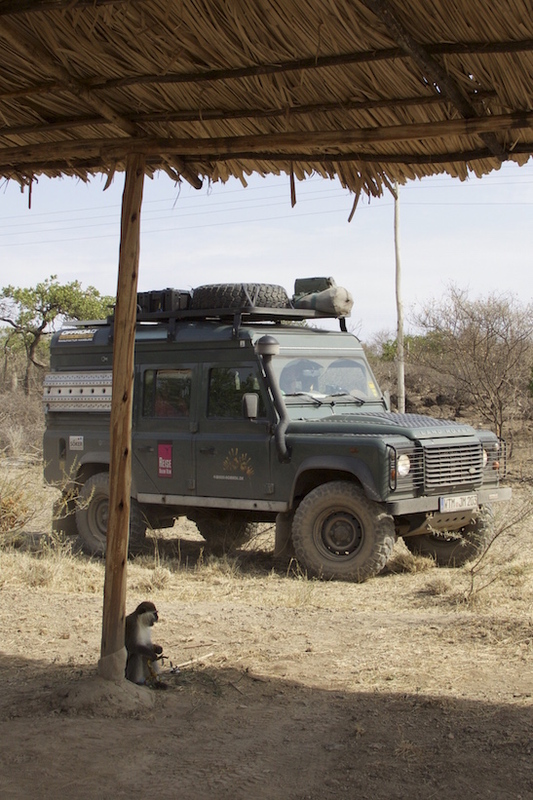 4-w-n: After three years of overland travel through Africa ... what is your impression of this supposedly "hardest continent" for overlanding? Was it dangerous sometimes? The Zapps: We were so fascinated!!!!!! We were planning only to travel one year.... but it was so wonderful!!!!!! We never were in danger! ... Yes, there were some challenges on the road that we took to have even more fun! 4-w-n: You have just crossed the Sinai peninsula and media and politicians explicitly warn against traveling there. What were your experiences there? How do you deal with traveling to "dangerous" regions anyway? The Zapps: The Read Sea!!!!! What a place!!!! The Mecca of scuba diving and snorkeling! We were there almost a month and just the idea to camp in front of the sea. wake up in the morning. get the snorkel and go out into a fascinating world of corals and trillions of colorful fishes ... that beats any bad news! We didn't see anything or experience anything but wonderful moments! 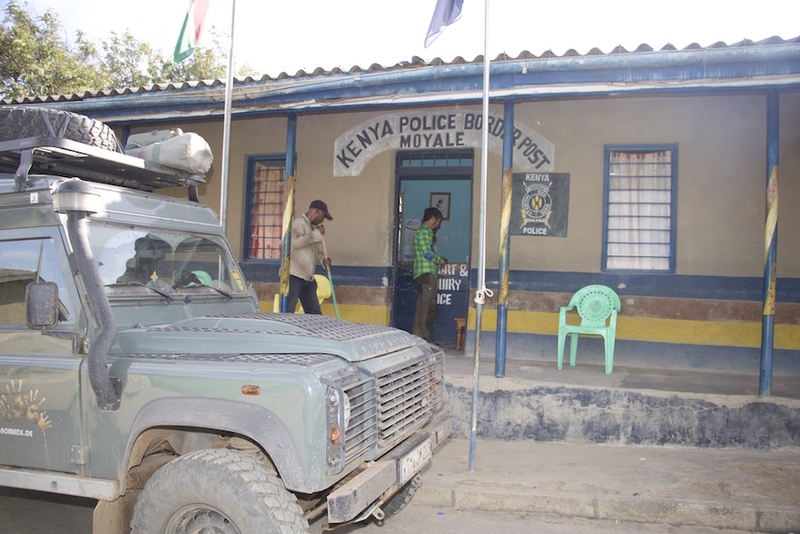 Maybe we didnt like so many army and police checkpoints. 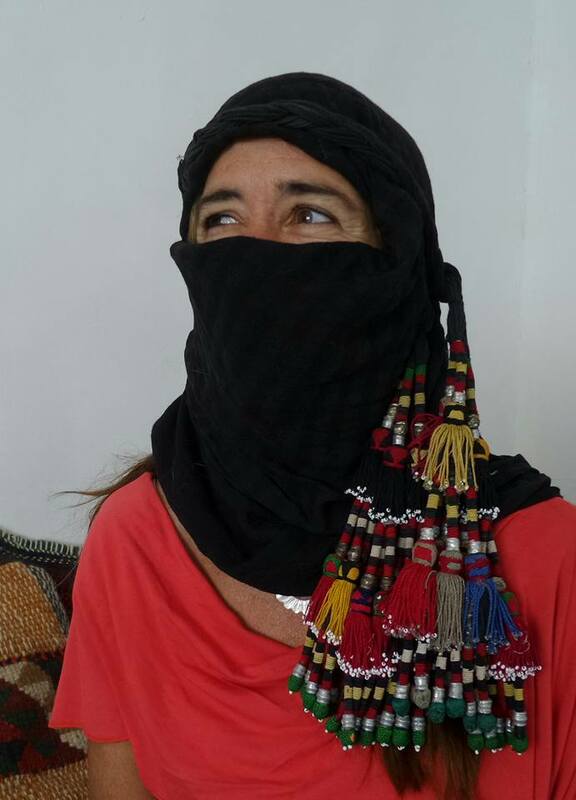 Candelaria disguised as a beduin woman. 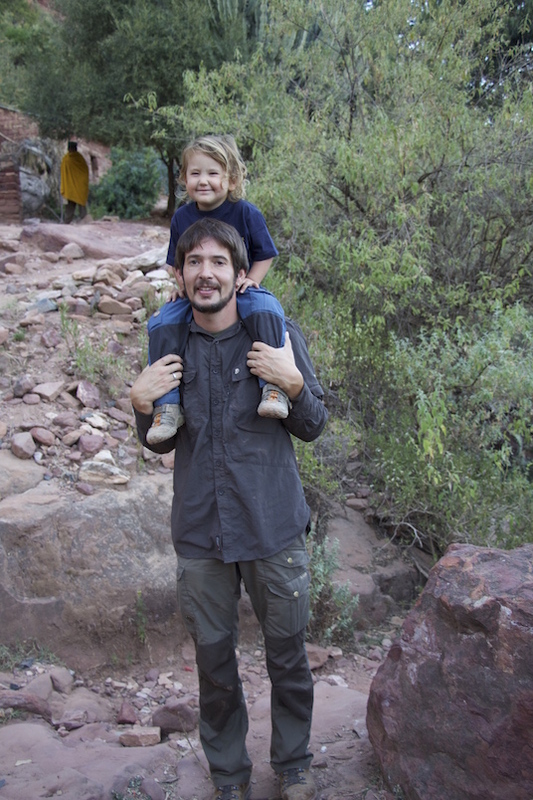 4-w-n: Going back to the topic "overlanding with kids" ... what effect does your way of living have on the personality of your children ... and how do your kids see this themselves? The Zapps: Charles Darwin said that it won't be the strongest or the most intelligent who would be the one to survive but the one who can adapt. And I think this kids learn to adapt a lot. Then, it is so important also to be an open minded person. And to believe in dreams. 4-w-n: Do you teach your kids yourself or do they "attend" an internet school? The Zapps: The kids follow a program from Argentina. 4-w-n: What are your future plans, e.g. thinking of secondary school qualifications of your kids? Is your plan to go on traveling and sending the kids to a boarding school or do you plan to "settle down" again? The Zapps: Boarding school sounds horrible for us! Where family time is not so important! ... But yes, qualifications. Why is it that today it's more important to have a career than family and dreams? When people ask our son Pampa what he wants to be when he has grown up, he says, "HAPPY!" Why is it so important to know of what we are going to live instead of for what we are going to live? 4-w-n: After all the distance you have created between you and what other people might call "normal society" or "normal life" - will returning be possible at all for you? Or do you plan not to come back anyway? 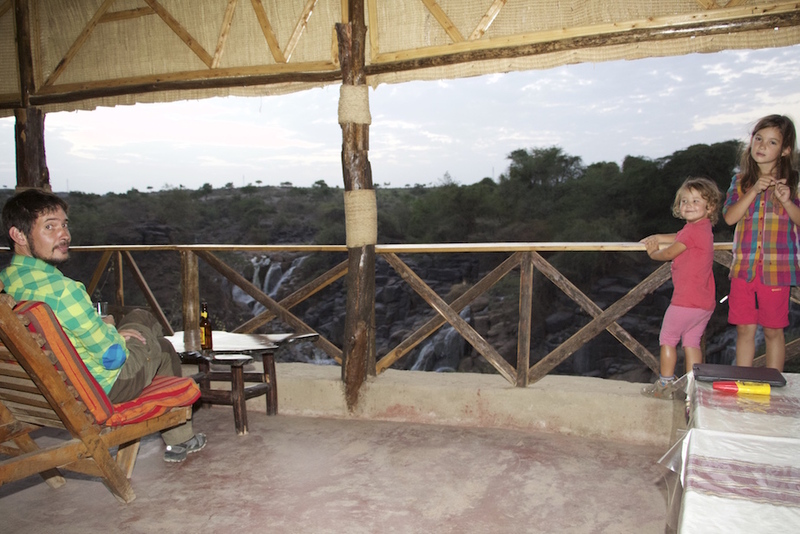 Did you find a "place" where you could imagine settling down again during your travels so far? The Zapps: Of course, we will go back! We are normal! The change in us doesn't make us feel out of society! ... As a traveler, you learn to adapt a lot. And all humans are adaptables! We may not work in an office ... but we do want to go back! Best place ... is where your family is. And Cande's and mine families are in Argentinia! This entry was posted in Meeting Overlanders and tagged Meeting Overlanders on 12. December 2015 by Juliane und Mischa. After the "Axum-virus" has stopped us from visiting this important city twice (first due to a gastro-intestinal virus Mischa caught when we were in Ethiopia last winter and second due to the recent virus which kept us busy for over ten days), now it finally is the right time: we drive to Axum and we even do this on one of the most important celebrations of the Ethiopan Orthodox Church, Maryam Tsion. 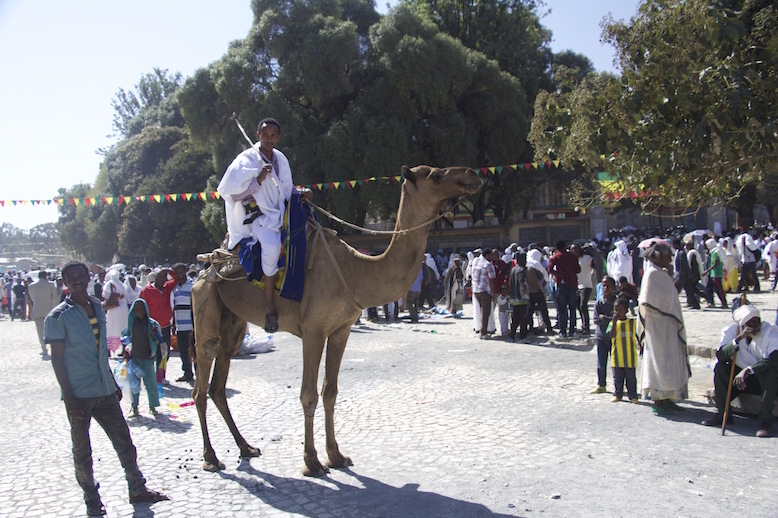 At Maryam Tsion the Ethiopians celebrate that Holy Mary seeked refuge from King Herod here in Axum with young Jesus. 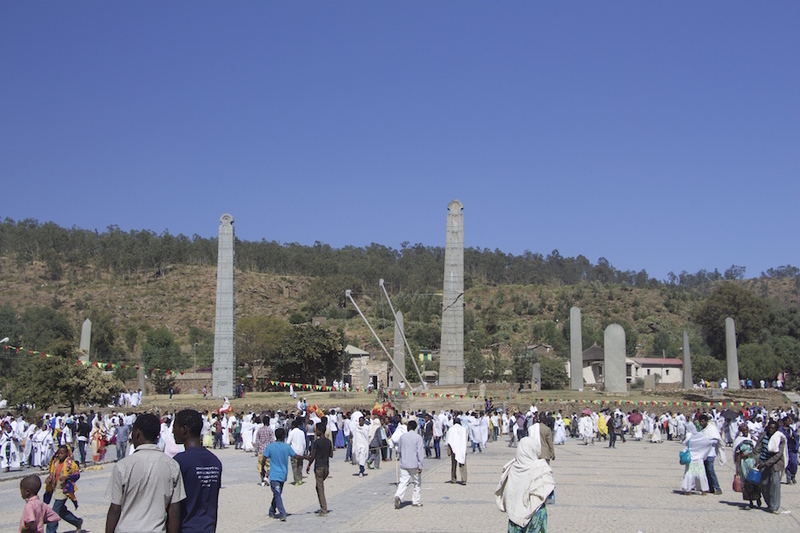 Also, Axum is one of the most important cities and sites for Ethiopians and Ethiopia as a nation in general. 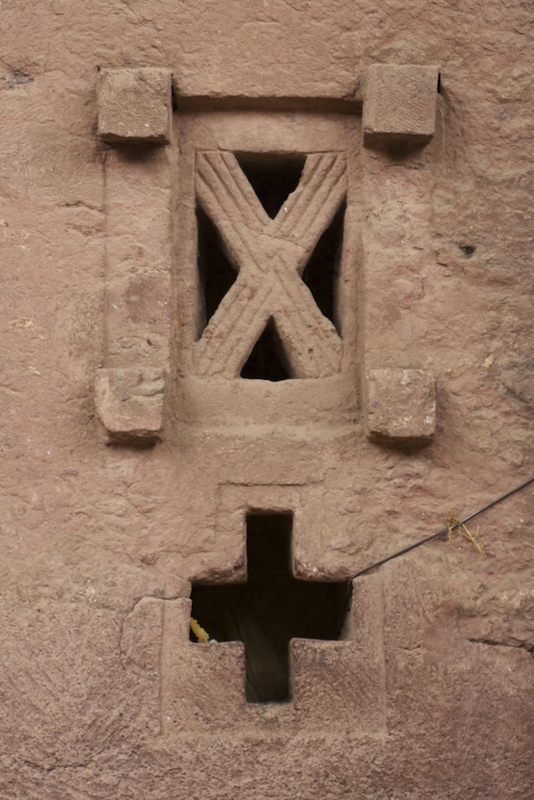 Between roundabout 400 BC and 700 AC, Axum was the capital of the Axumite kingdom, reaching far into Sudan and southern Arabia, with trade routes going as far as Italy, Syria and India, it being one of the most powerful kingdoms of the ancient world. 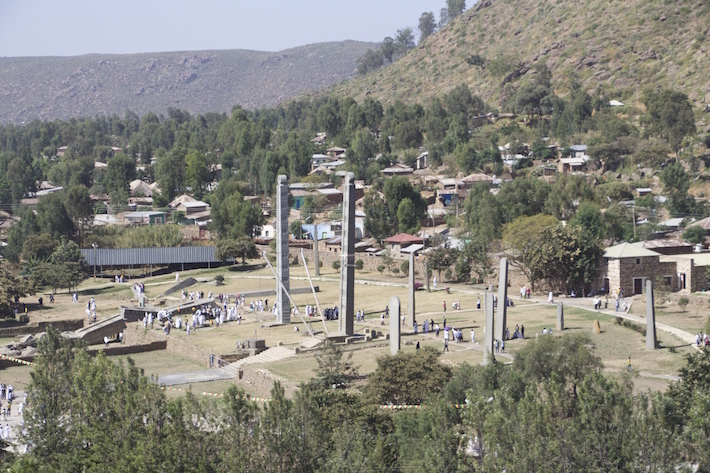 An overview on the Axum stelae. This stela is 33,3m long, weighs 517 tons and is the largest manmade monolith of the antique world ... it seems that it broke when people tried to erect it first time. 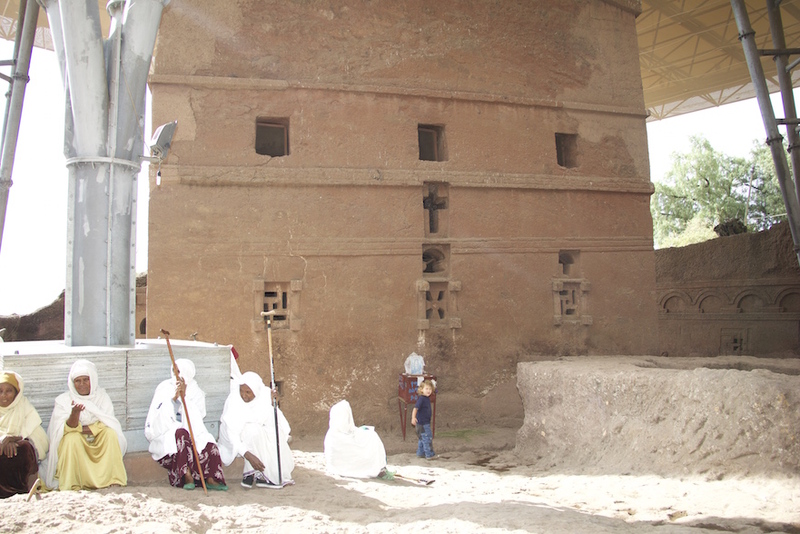 This is the second largest stela in Axum (24m, 152 tons), which was stolen in 1937 by the Mussolini government of the then occupying power, Italy, and brought back to Ethiopia in 2005 (as the result of a contract signed in 1947!). 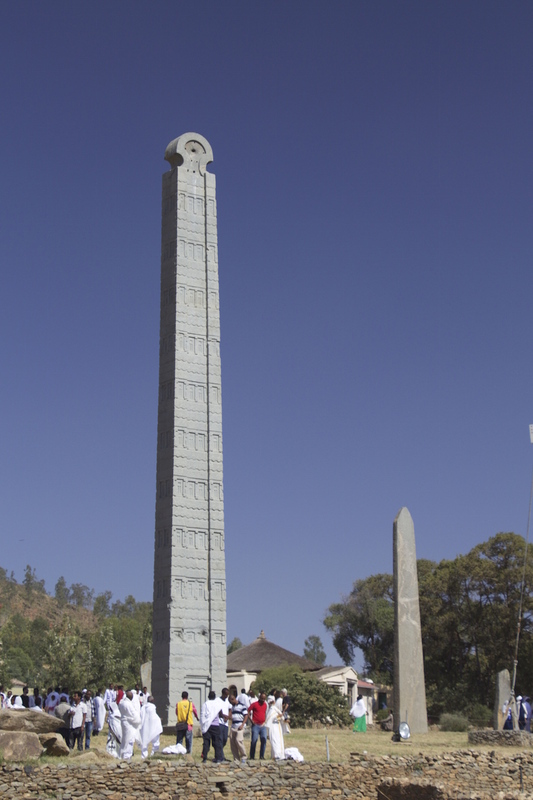 The famous 1800-year-old Axum Stelae are still impressive symbols of power. 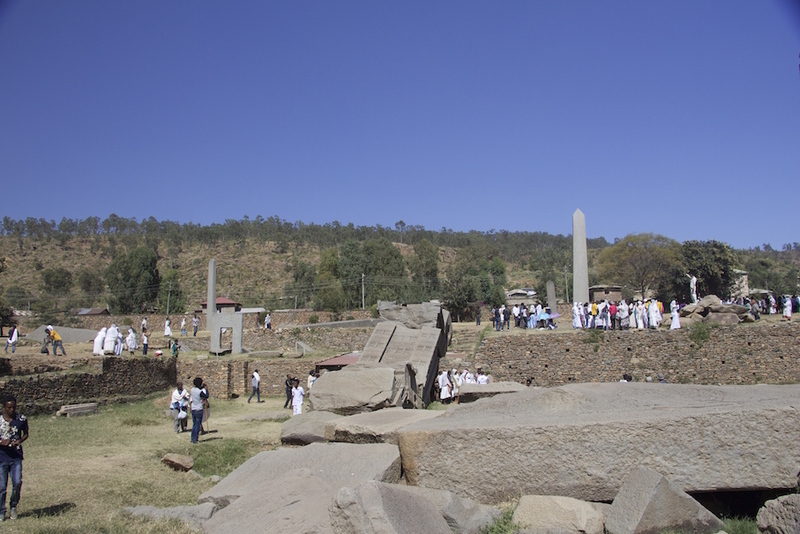 Axum is also said to have been the capital of the mysterious kingdom of the queen of Sheba in 1000 BC. 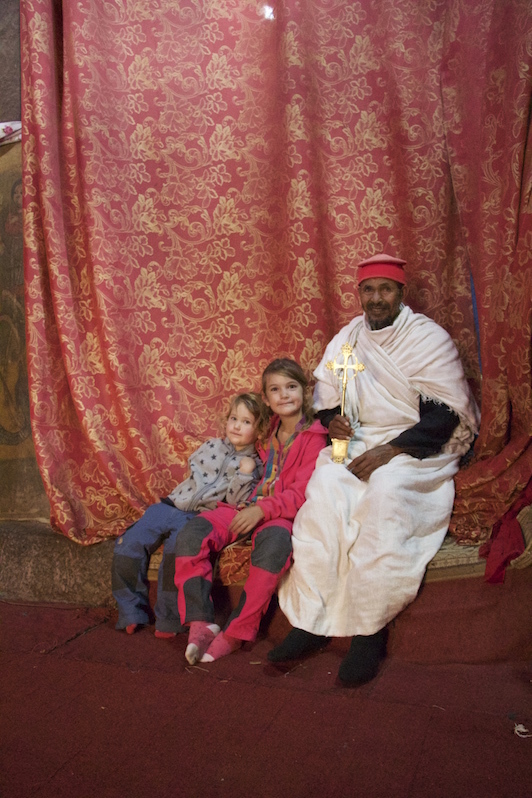 Here, another story unfolds to explain the long connection of Ethiopia, Israel and the Jewish faith: the queen of Sheba and one of her noblewomen once went on a long travel from their home in Tigray, Ethiopia, to visit the famous King Solomon in Jerusalem. Apparently, both ladies got a "special gift" from Solomon to take home: both women came back pregnant from that visit and later on would both give birth to sons. These sons, after having grown up, went back to Israel to visit their father. The son of the queen of Sheba, Menilek, being more intelligent, found and recognized his father who then wanted to make him his successor. But, the people did not want him, so he had to leave. 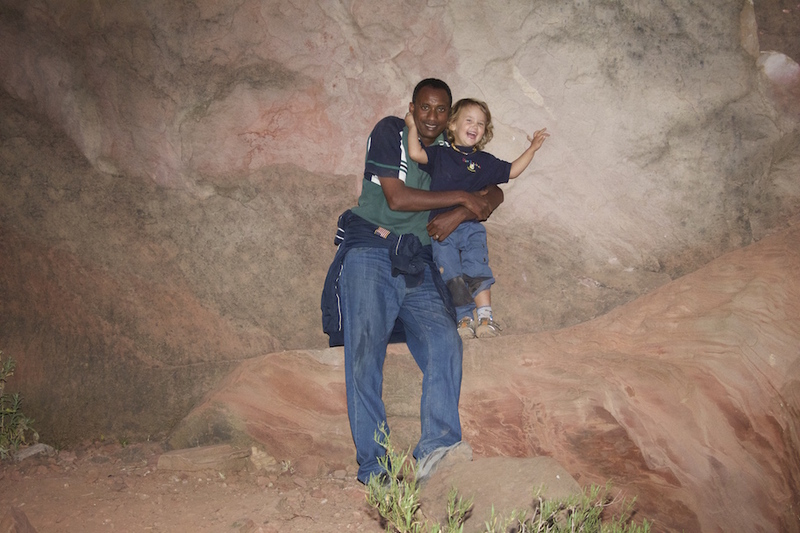 Because his father had to send him away back to his home country in Ethiopia, he ordered all families in Israel to give their firstborn son to accompany Menilek. 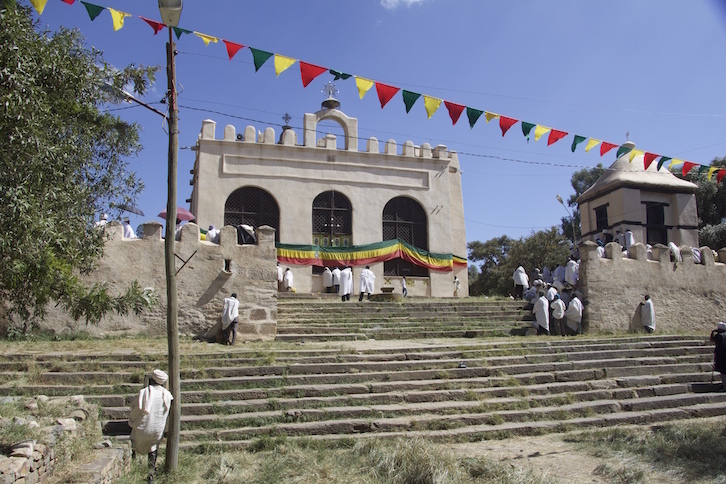 This small church built by emperor Haile Selassie I. is supposed to keep the Ark of the Covenant brought to Ethiopia by Menilek I.
Menilek being not only intelligent, but also quite rakish, took the famous Ark of the Covenant (a wooden container keeping two tablets of the Law on which Moses wrote down the ten commandments) from his father and brought it to Axum, where today it still is supposed to be kept in a church specially made for it by Emperor Haile Selassie (before it was in the older church nearby). 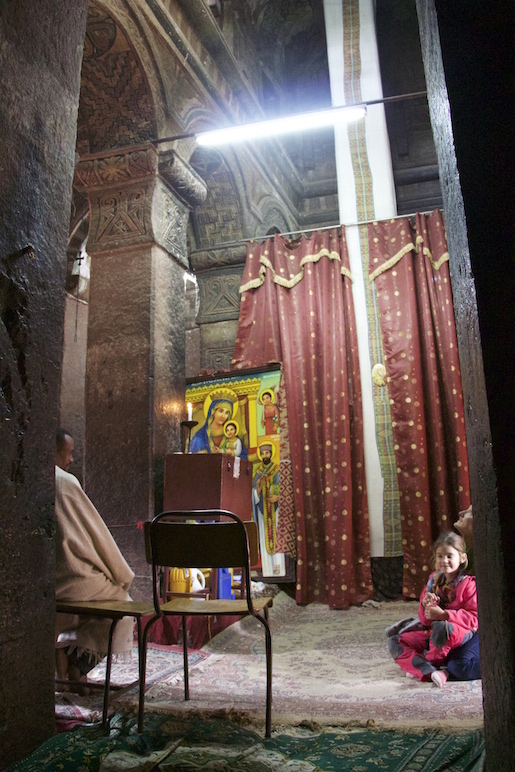 It is guarded by one monk only who also is the only one allowed to see the Ark (no scientific investigation on this matter has been accepted by the Ethiopian Orthodox Church). 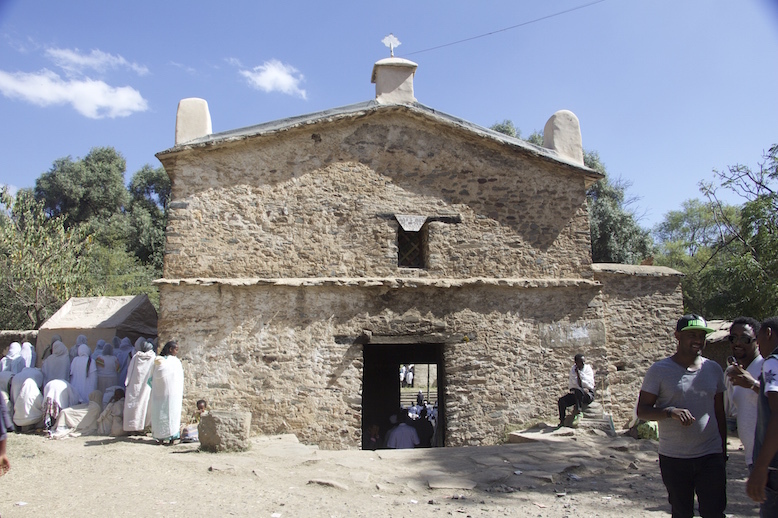 Enda Maryam Tsion ... maybe the first Christian church on Ethiopian soil and the place where Menilek I. had the Ark of the Covenant stored after having taken it from his father King Solomon, in Jerusalem. 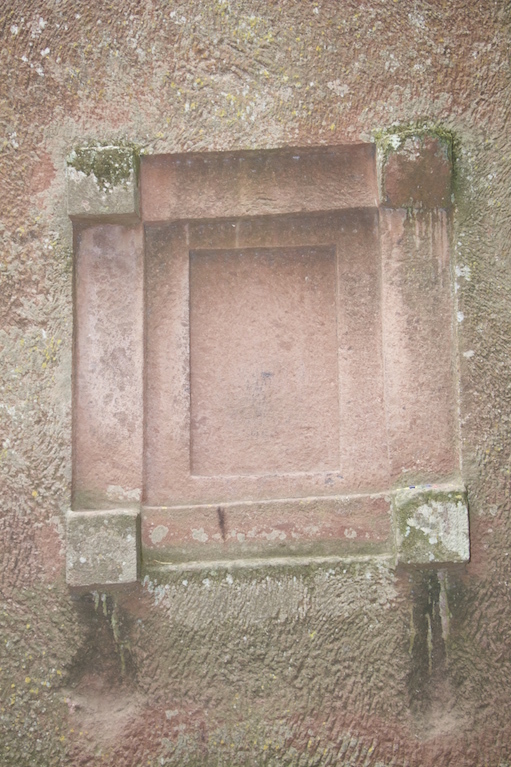 After this gate, only men are allowed to pass into the courtyard of the church. The old gate to the church area. Women praying outside the wall of the church's courtyard facing the Ark of the Covenant. 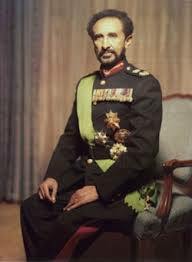 The kings and emperors of Ethiopia have until the end of the monarchy in 1974 based a main part of their right to power on this Solomonic ancestoral connection which brought them into one line not only with the mysterious queen of Sheba and King Solomon, but also with King David and even Jesus. This connection and prophesies from the Bible (e.g. Zephaniah 3:10 "From beyond the rivers of Ethiopia My worshippers, the daughter of My dispersed ones, shall bring my offering" and Psalm 2 "Yet I set my Holy king on My Holy hill of Zion") then were interpreted by Marcus Garvey in Jamaica in the 1930s to found the Rastafarian religion (the term "Rastafari" coming from Emperor Haile Selassie's title "Ras Tafari Makonnen Woldemikael" when he was governor of Harar) who believe that Halie Selassie was the living god (Jah!). The mosque at Negash ... this small village south of Adigrat being the very place where The Prophet Mohammad sent his wife and children because they were persecuted in Saudi Arabia because of introducing Islam. 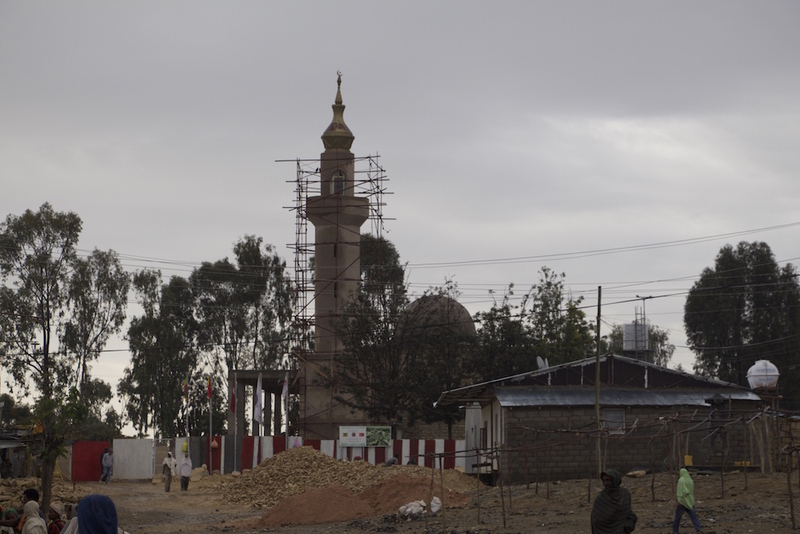 But there is also a strong connection with Islam, as the story goes that The Prophet Mohammed, after having been persecuted in Saudi Arabia for introducing the new faith, sent his family to the village of Negash, just a few kilometres south of Adigrat. 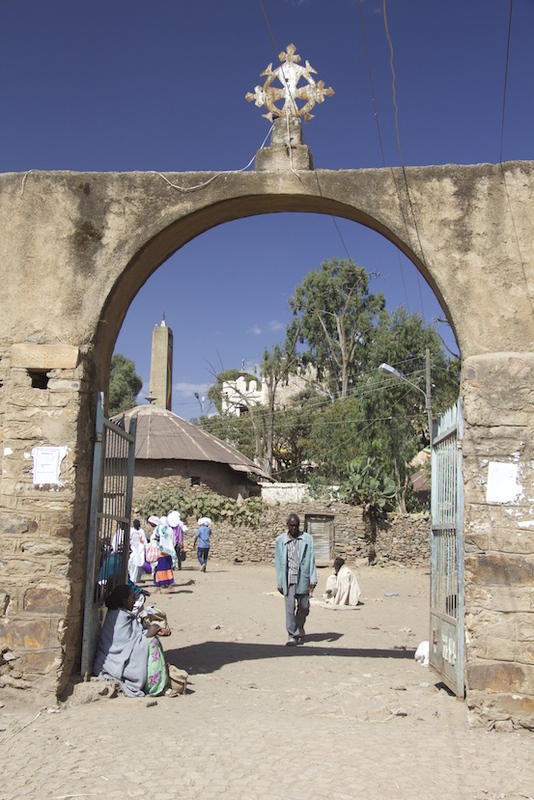 The site where the Negash mosque is situated today is said to have been the site of the second mosque ever existing and because of that is an important pilgrimage for Muslims not only from Ethiopia. 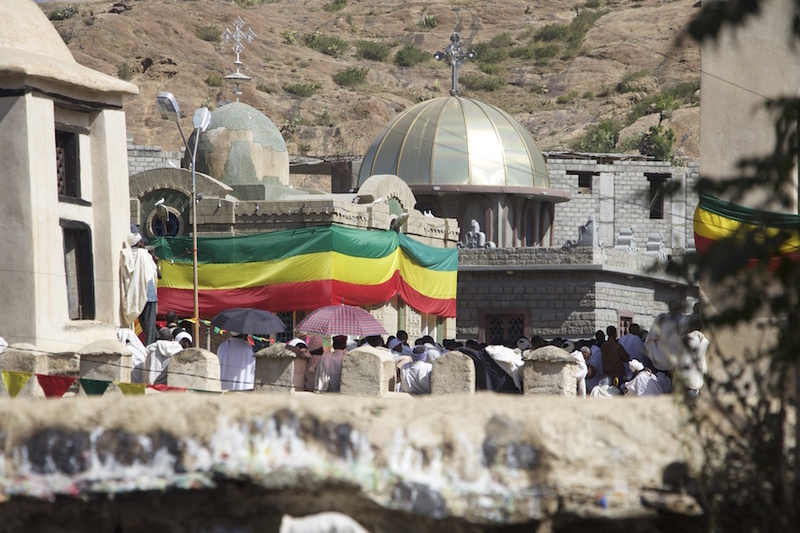 Thus, even though Ethiopia is geographically so very far away from Europe, Israel and northern Africa, and even was a very isolated country until quite recently, it is still deeply connected with three religions and continents alike. 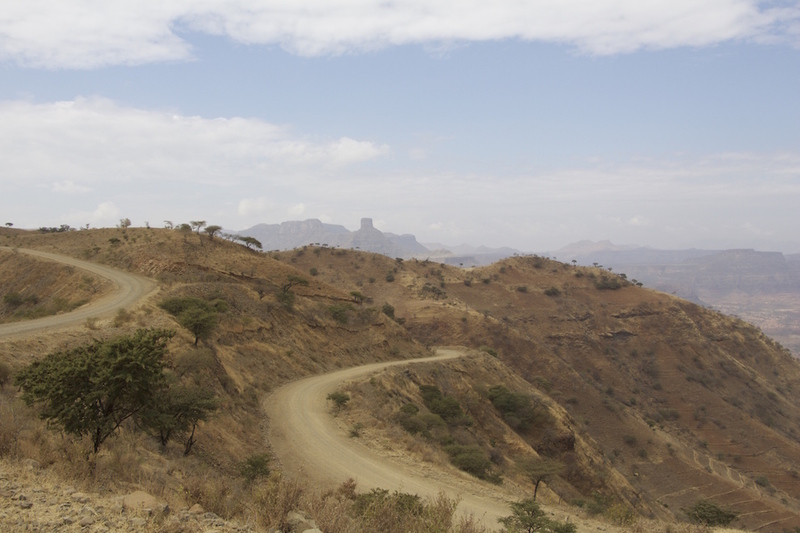 This entry was posted in Africa Overland and tagged Ethiopia on 11. December 2015 by Juliane und Mischa.